While working on the Life List of All the Birds We Have Seen, I came across this video and decided to share it. 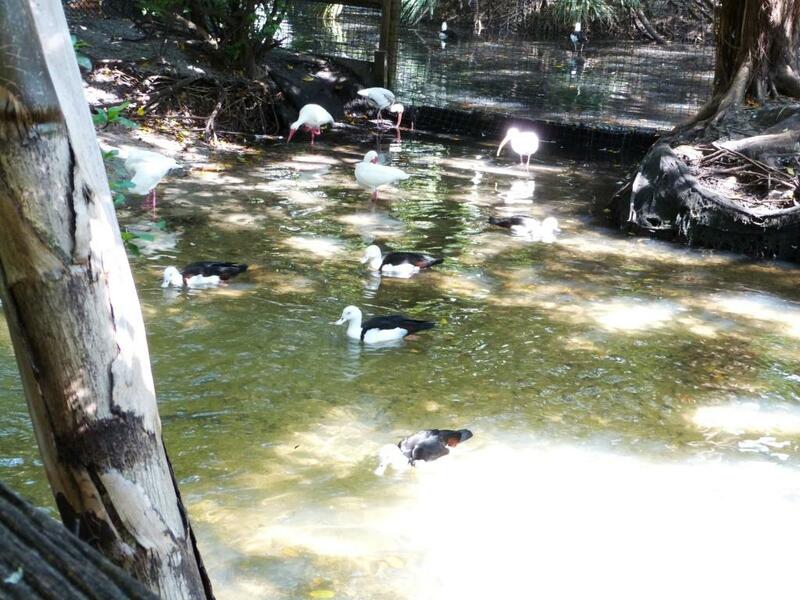 We were at the Wings of Asia Aviary at Zoo Miami. “The Mandarin Duck (Aix galericulata) is a perching duck species found in East Asia. It is medium-sized, at 41–49 cm (16–19 in) long with a 65–75 cm (26–30 in) wingspan. It is closely related to the North American wood duck, the only other member of the genus Aix. Aix is an Ancient Greek word which was used by Aristotle to refer to an unknown diving bird, and galericulata is the Latin for a wig, derived from galerum, a cap or bonnet. 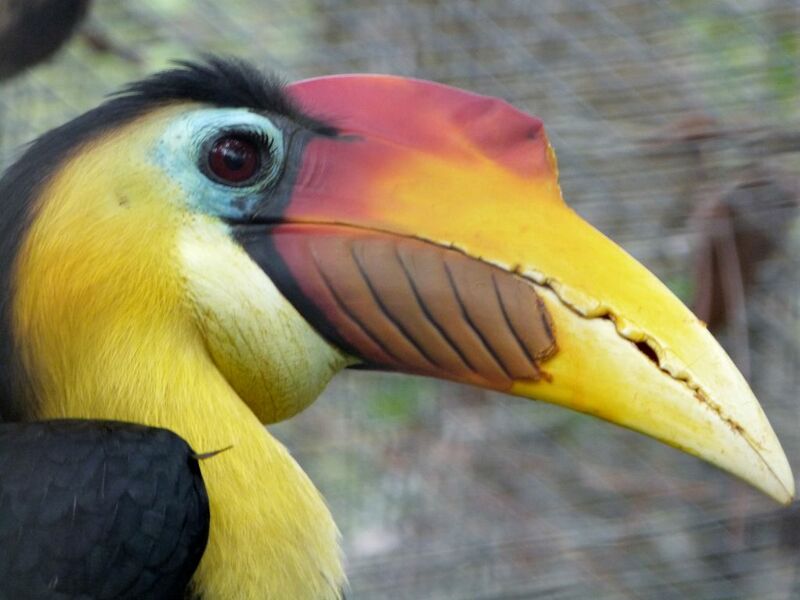 The adult male has a red bill, large white crescent above the eye and reddish face and “whiskers”. The breast is purple with two vertical white bars, and the flanks ruddy, with two orange “sails” at the back. 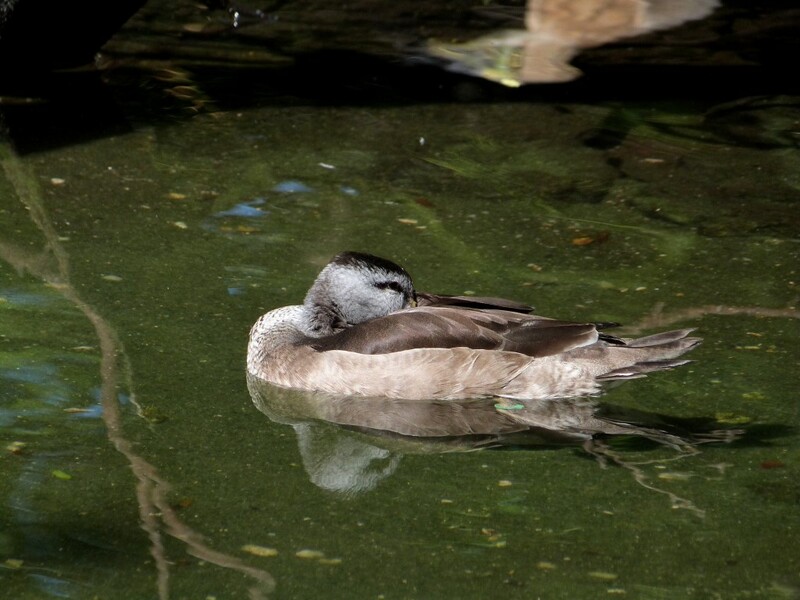 The female is similar to female wood duck, with a white eye-ring and stripe running back from the eye, but is paler below, has a small white flank stripe, and a pale tip to its bill. Both the males and females have crests, but the crest is more pronounced on the male. I was checking around the state to see what was being done to prepare for the Hurricane. 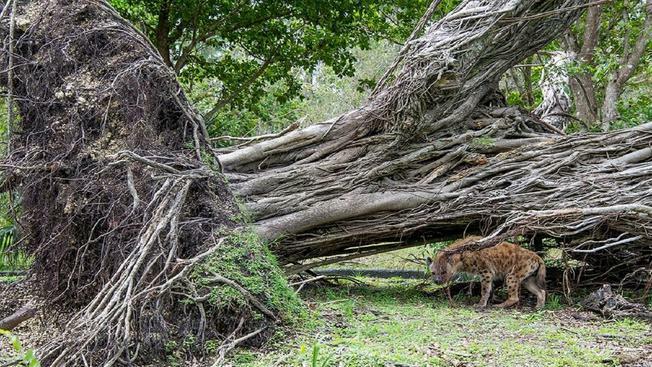 Now, almost two months later, how did the Zoos do during and after the storm. We were discussing maybe visiting one of the zoos in a month or so, and I was wondering how much damage they received. Actually, one of our favorite birding places here in Lakeland, the Circle B Bar Reserve, just re-opened today, October 13, 2017. They had numerous downed trees and flooding. 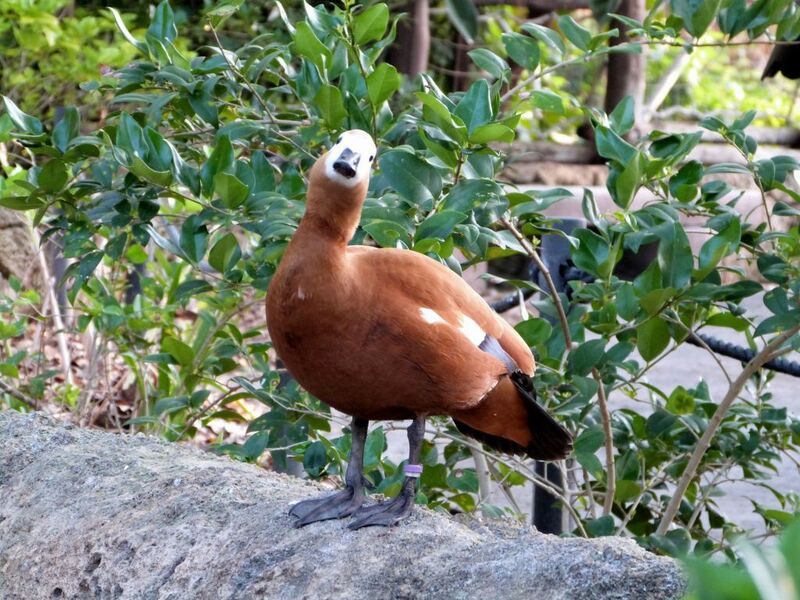 While checking out my most favorite birding place at a Zoo, Zoo Miami, they are actually opening back up tomorrow, October 14th for the first time since Hurricane Irma. Here are some articles and video that you might find informative as to how they did and how they protected their animals. 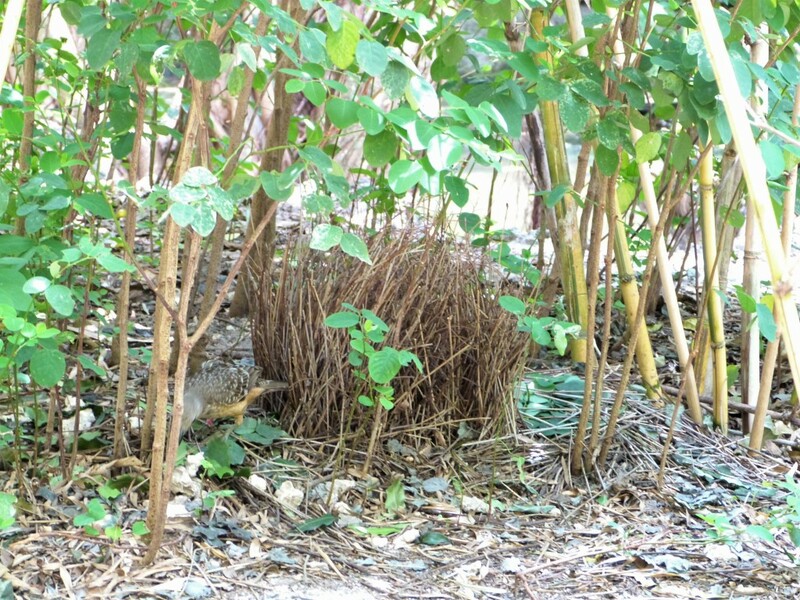 “We greatly look forward to opening Zoo Miami again,” Zoo Miami director Carol Kruse said. 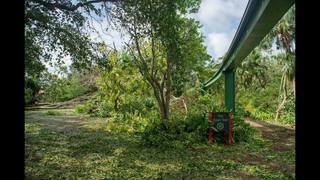 Go to Google and search: “Zoo Miami irma” and you will find many photos of the protected animals and damage around the Zoo. Most of these are Copyrighted and can not be shared here. I was fortunate to receive a list of the current birds from the workers, which has been a huge help. 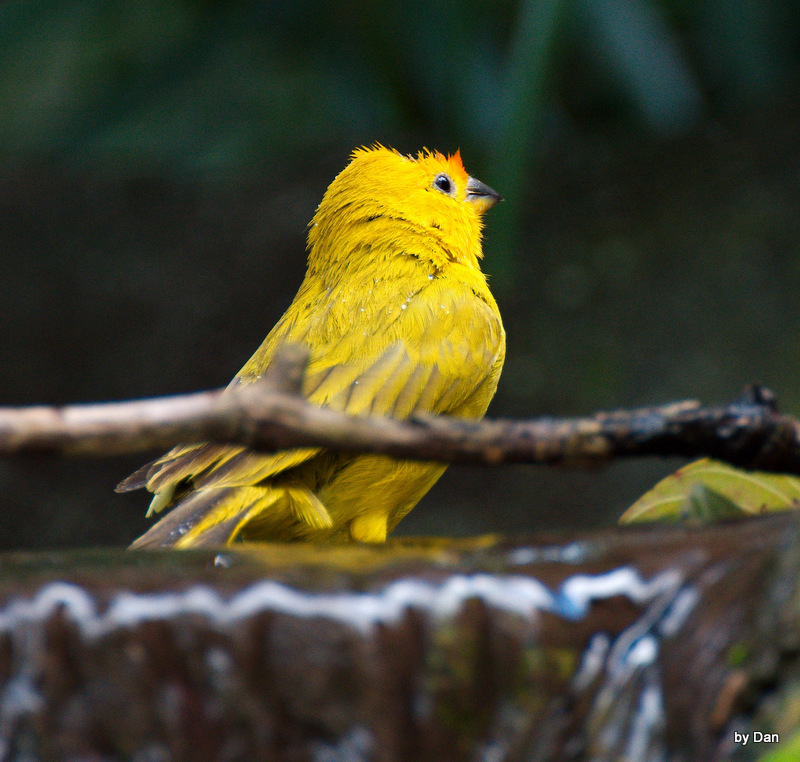 With at least 500 birds and 88 species in one aviary, it can get complicated putting names on the right birds. Now there is a beautifully designed avian wonder from the Creator. More about this bird later. 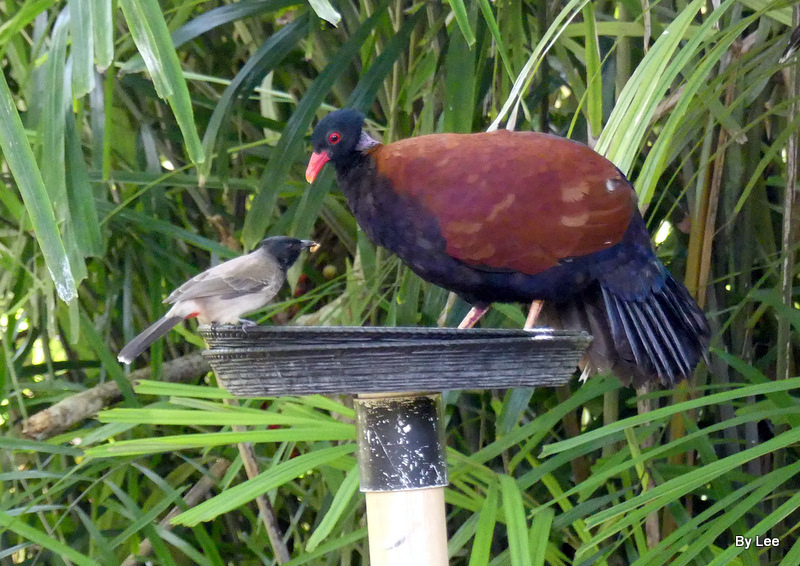 The Siamese Fireback is also in the Pheasant family. So, when our mystery bird showed up, which family do you think I kept looking through? 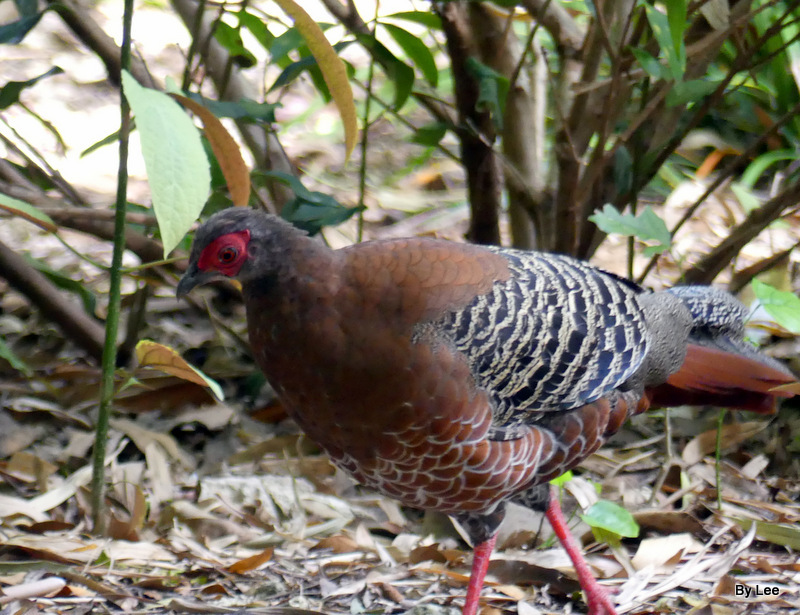 The Pheasants and allies – Phasianidae Family. I searched high and low. 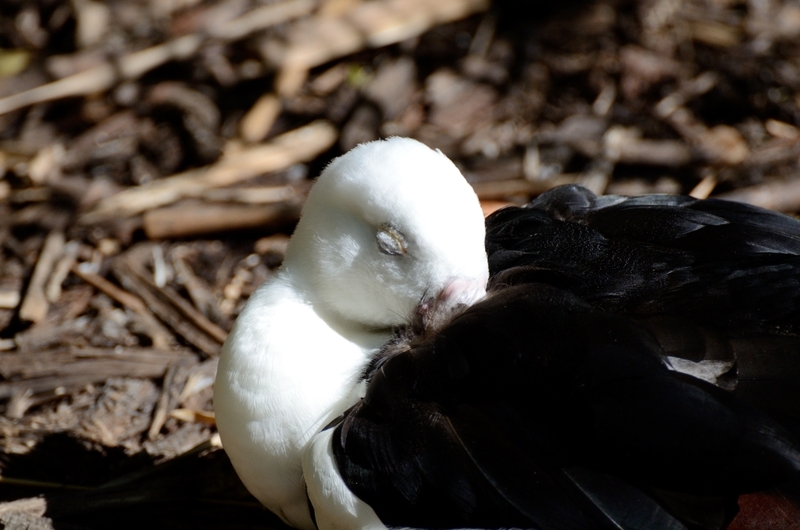 Guess what this bird is! 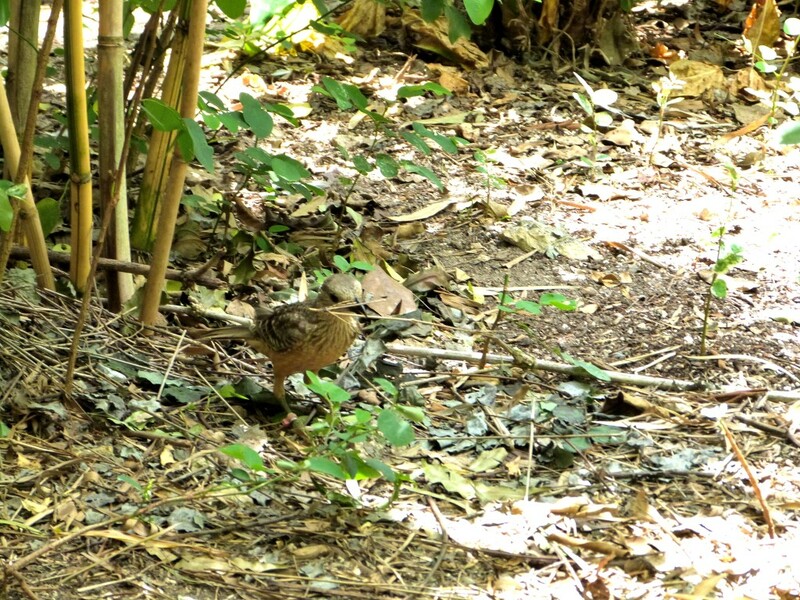 Can you guess what this bird is? I about fell out of my computer chair when I found out. Our Mystery Bird turns out to actually be a Pigeon!!!. 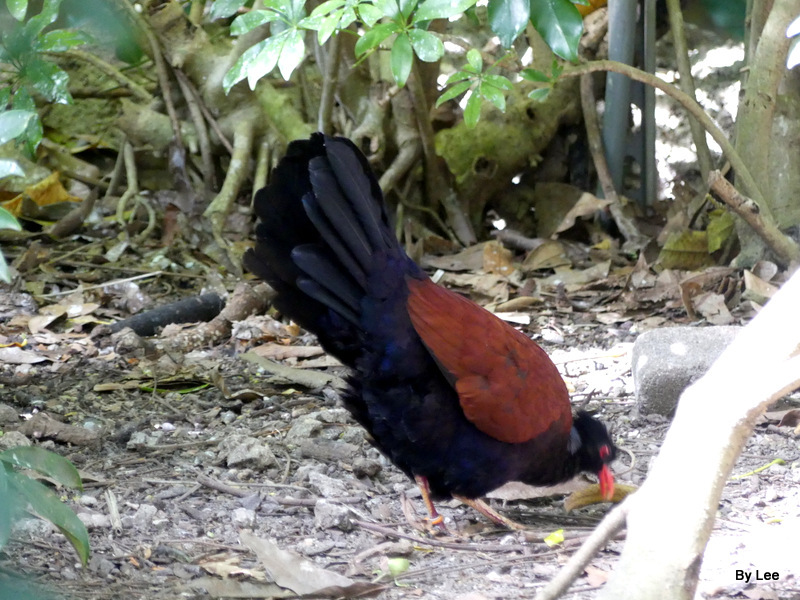 This is a Pheasant Pigeon (Otidiphaps nobilis) [Green-naped Pheasant Pigeon] as Zoo Miami calls it. I Just Couldn’t Believe THIS IS A PIGEON!!!!! 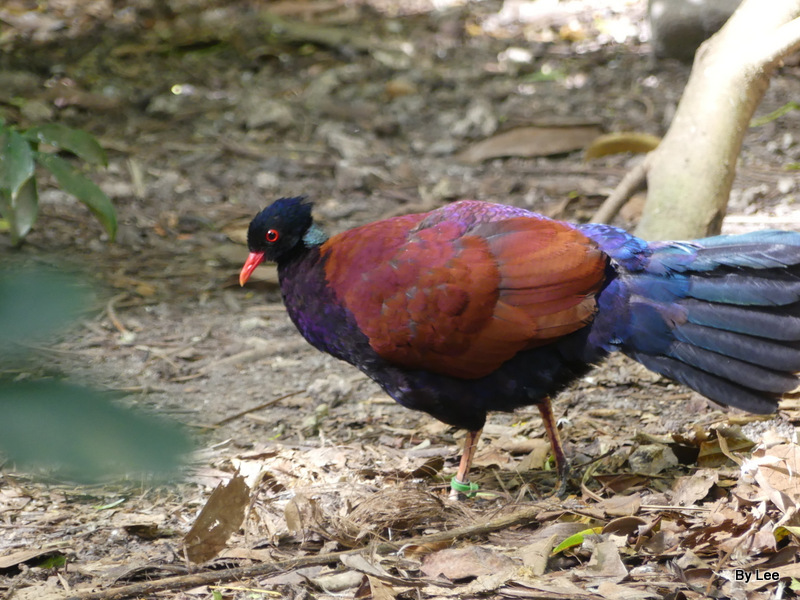 “The pheasant pigeon (Otidiphaps nobilis) is a genus of large terrestrial pigeon found in the primary rainforests of New Guinea and nearby islands. It ranges primarily over hilly and lower mountain areas, but can also be found in lowlands. I didn’t see the female, if they had one, but thought you might like to see the difference between the male and the female. They are about 6 inches in length. 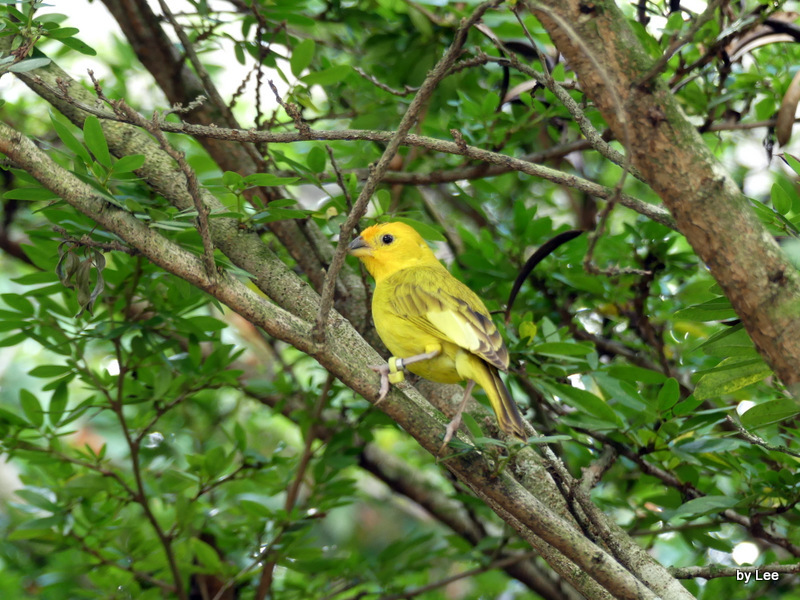 The Saffron Finch is also known as the Yellow Finch and Pelzeln’s Finch. It was first described by Carolus Linnaeus in 1766. 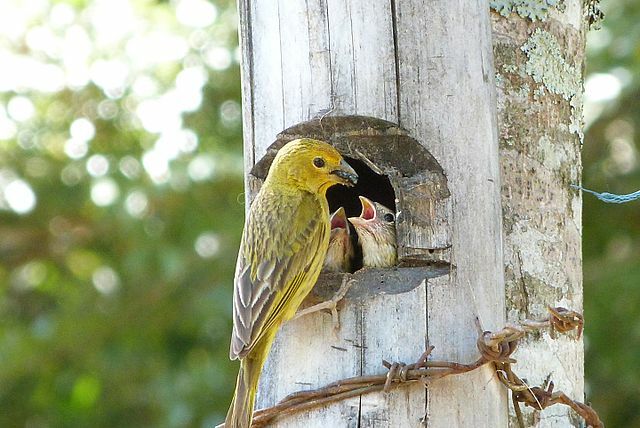 A group of finches has many collective nouns, including a “charm”, “company”, and “trembling” of finches. Here is some video that I shot of this beauty. I tried to catch him in the trees and that is a challenge, as any birdwatcher knows. But then, to my surprise, he just decided that he needed a bath. Wow! We have lots of photos from the trip, so stay tuned! 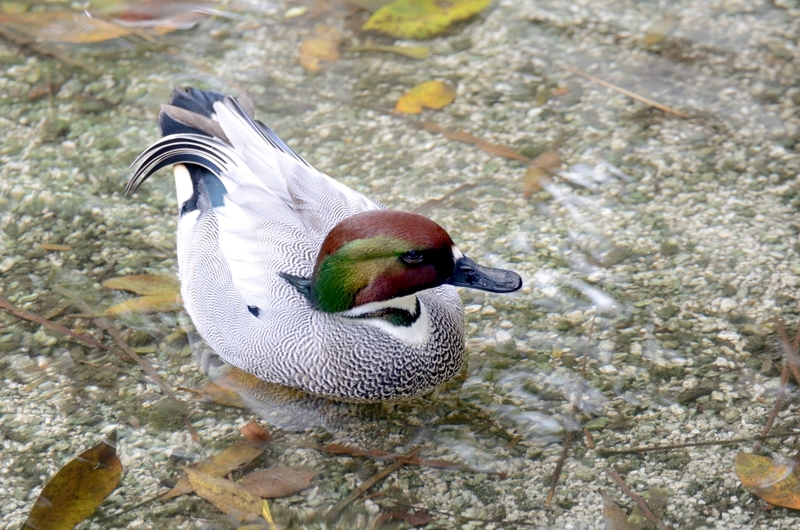 While we were on our latest visit to the Wings of Asia Aviary at Zoo Miami, the Falcated Duck caught my attention. 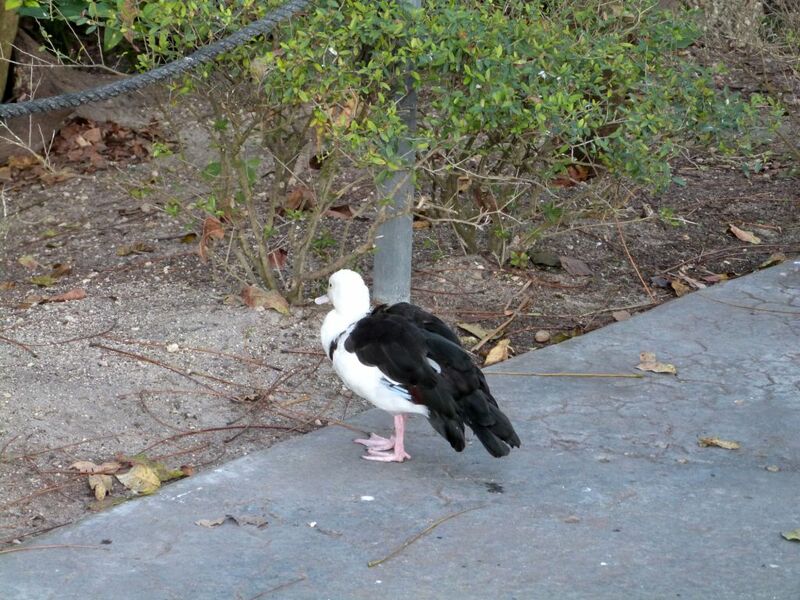 We have seen it before, because there are photos of them, but for some reason, it was just another duck then. The sun caught its iridescent head and I started looking closer this time. Wings of Asia has one male and one female at this time. 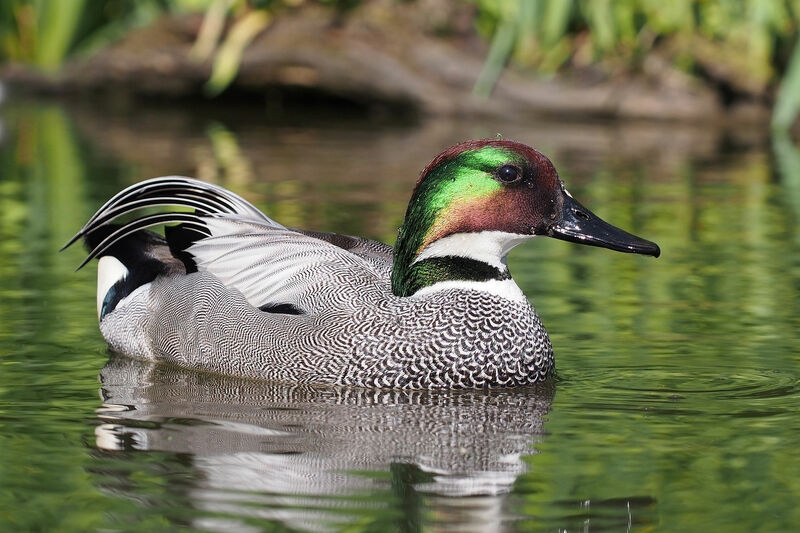 These Falcated Duck (Teal) are just one more example of the variety and beauty the Lord gave His creatures when they were created. Apparently when the male wears his breeding plumage, that green really shines. I tried to get photos of his beautiful feathers at the back, but my photos aren’t the best, but maybe you can catch some of the great beauty that the Lord gave these Falcated Ducks. Males and females have similar lengths at 19-21.5 in (46 to 53 cm.) Their weight can range from 422 to 770 grams, with males weighing more than their female counterparts. Wingspans range from 31-36 in (79 to 91 cm). The breeding male is unmistakable. Most of the body plumage is finely vermiculated grey, with the long sickle-shaped tertials, which give this species its name, hanging off its back. The large head is dark green with a white throat, and a dark green collar and bronzed crown. The vent region is patterned in yellow, black and white. 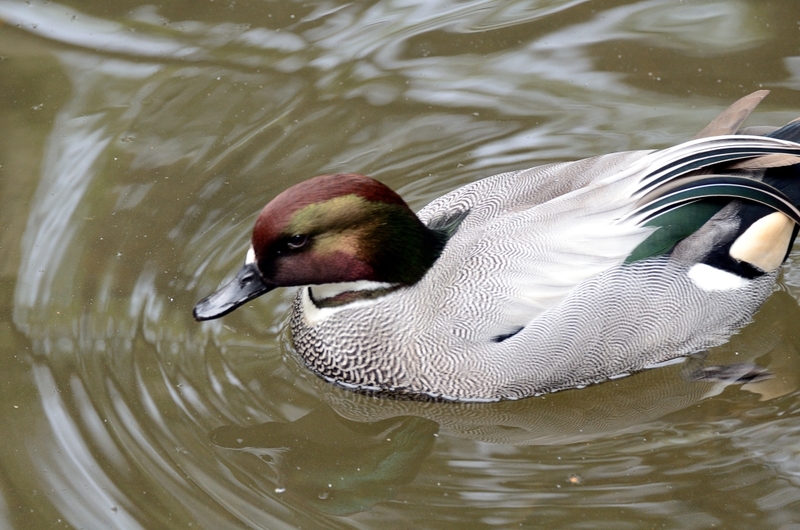 The female falcated duck is dark brown, with plumage much like a female wigeon. Its long grey bill is an aid to identification. The eclipse male is like the female, but darker on the back and head. In flight both sexes show a pale grey underwing. The blackish speculum is bordered with a white bar on its inner edge. 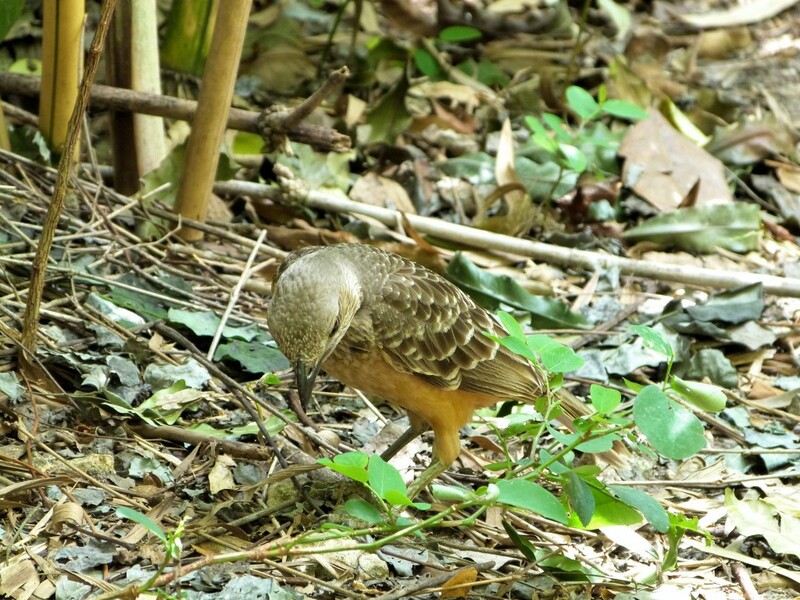 Young birds are buffer than the female and have short tertials. Juveniles have plumage similar to females of the species. 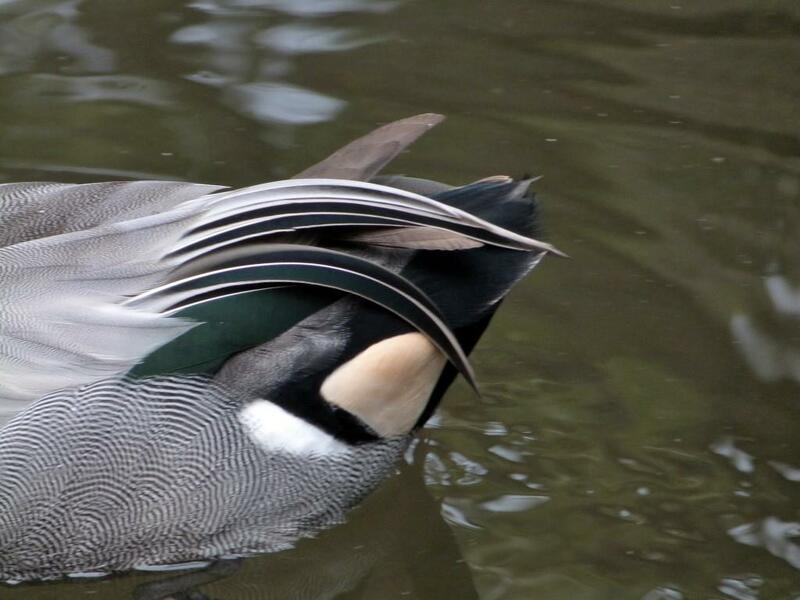 The Anas falcata are known to have very striking and beautiful sickle feathers. This is in comparison with many other birds like swams and geese. 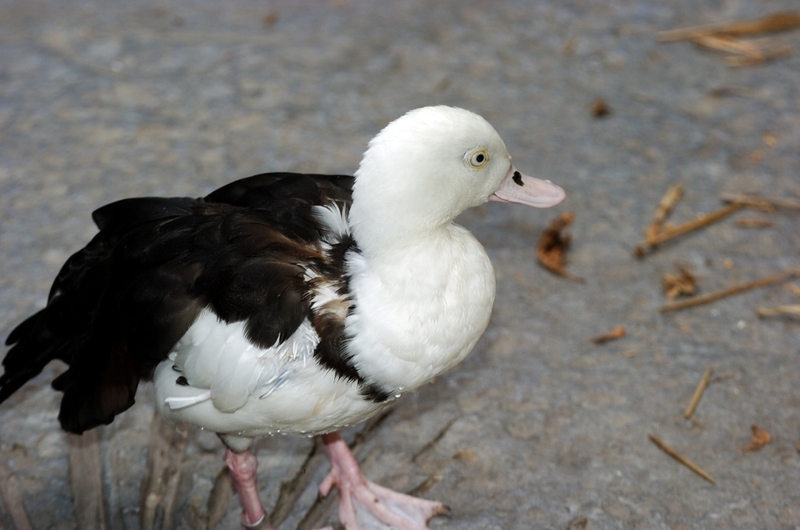 Medium dabbling duck with long black and white tertial feathers extending over black rump. Body white, black, gray in finely-scaled pattern. The crested iridescent head is green and purple-brown. White throat has black ring; black tail and black-green speculum are edged in white. 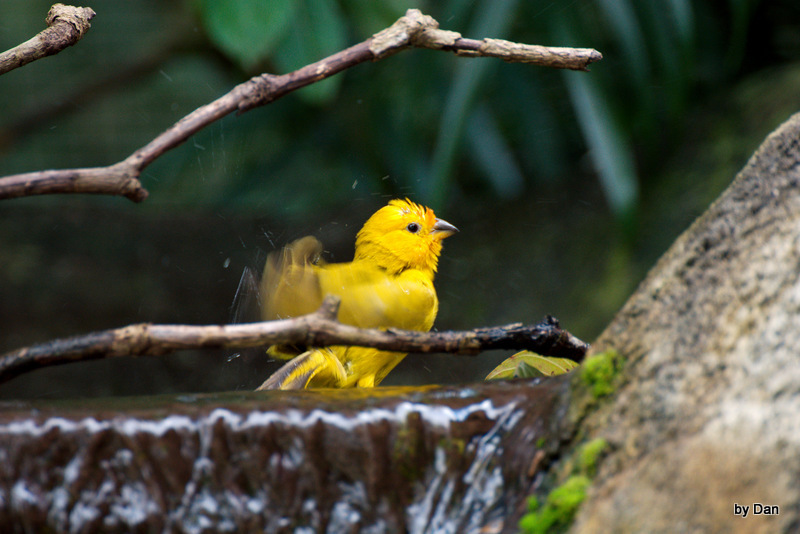 Here’s a short clip I took of him washing his feathers at Zoo Miami. Let me introduce you to another interesting avian friend from His Creator’s Hand. 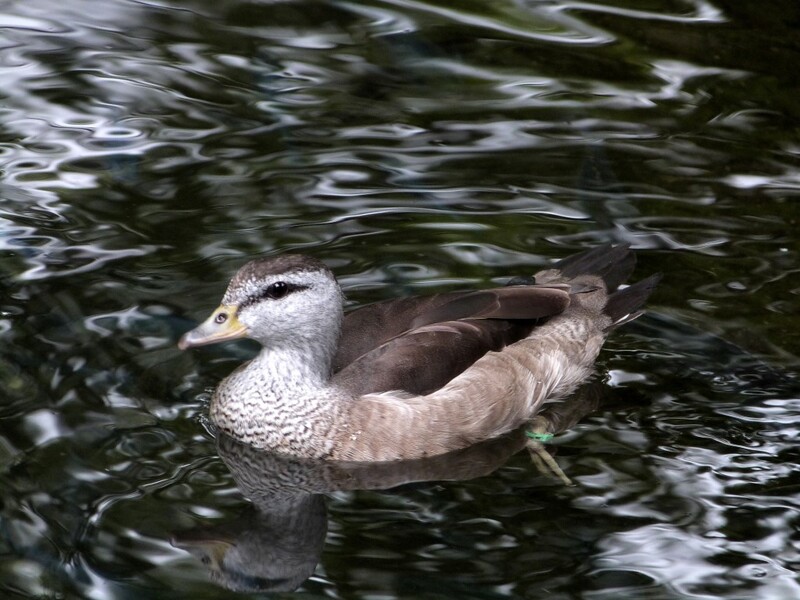 This is the Cotton Pygmy Goose or Cotton Teal (Nettapus coromandelianus) which is a small perching duck that breeds in Pakistan, India, Bangladesh, southeast Asia and south to northern Australia. 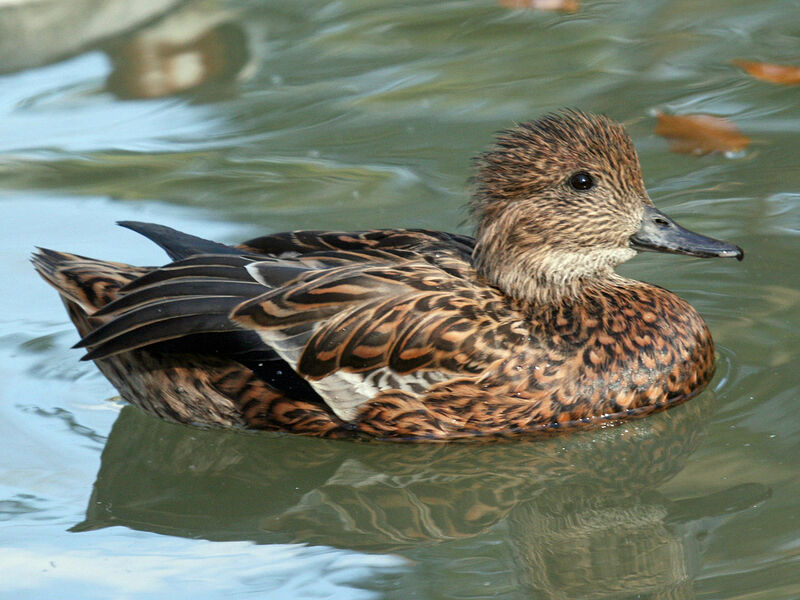 Small individuals of this species are the smallest waterfowl on earth, at as little as 5.6 oz (160 g) and 10 in (26 cm). White predominates in this bird’s plumage. Bill short, deep at base, and goose-like. Male in breeding plumage is glossy blackish green crown, with white head, neck, and underparts; a prominent black collar and white wing-bar. Rounded head and short legs. In flight, the wings are green with a white band, making the male conspicuous even amongst the huge flying flocks of the lesser whistling duck, which share the habitat. Female paler, without either black collar and only a narrow or nonexistent strip of white wing-bar. In non-breeding plumage (eclipse) male resembles female except for his white wing-bar. Flocks on water bodies (jheels), etc. It is largely resident, apart from dispersion in the wet season, but Chinese birds make long-distance migrations to winter further south. 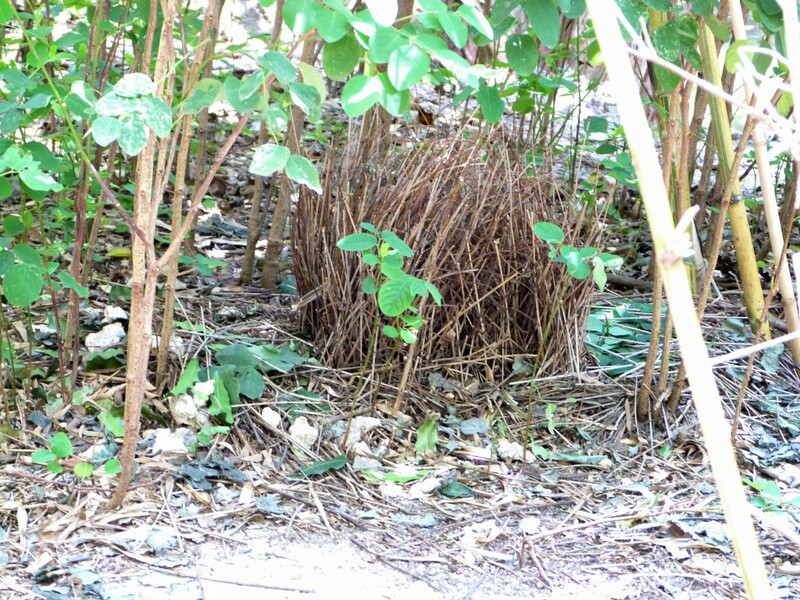 It nests in tree holes, laying 8–15 eggs. 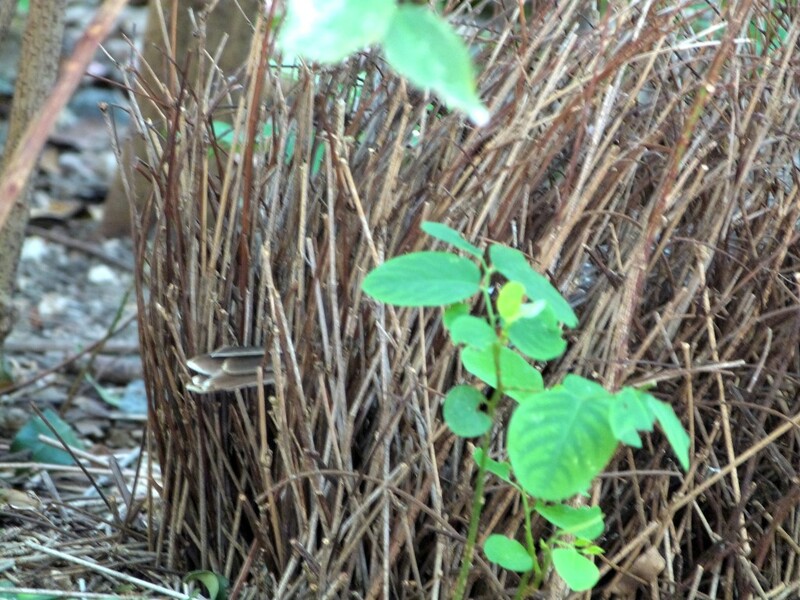 The nesting season is July to September (SW. monsoon). 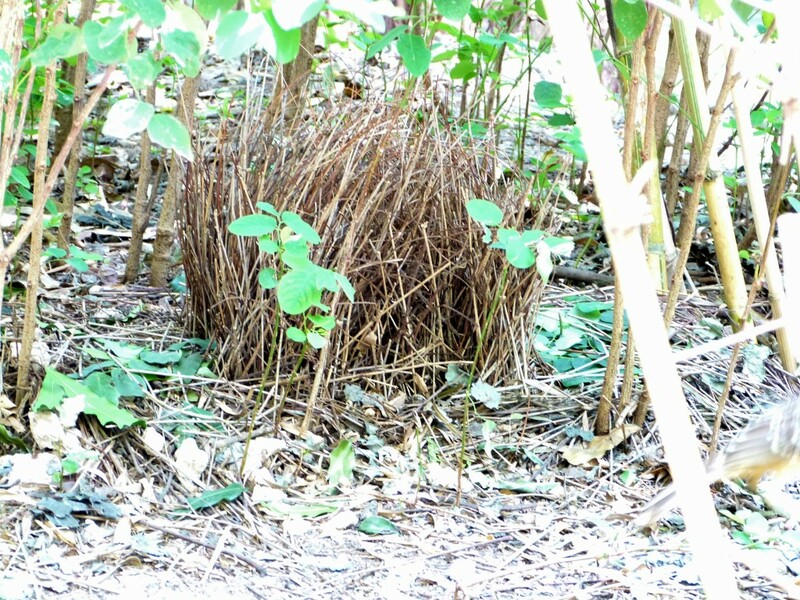 Its nest is a natural hollow in a tree-trunk standing in or near water, sometimes lined with grass, rubbish and feathers. The eggs, are ivory white. This is an abundant species in Asia, although the slightly larger Australian race appears to be declining in numbers. Found on all still freshwater lakes (jheels), rain-filled ditches, inundated paddy fields, irrigation tanks, etc. Becomes very tame on village tanks wherever it is unmolested and has become inured to human proximity. Swift on the wing, and can dive creditably on occasion. Found in ponds and lakes in southern Pakistan . However numbers are declining and it is definitely endangered. 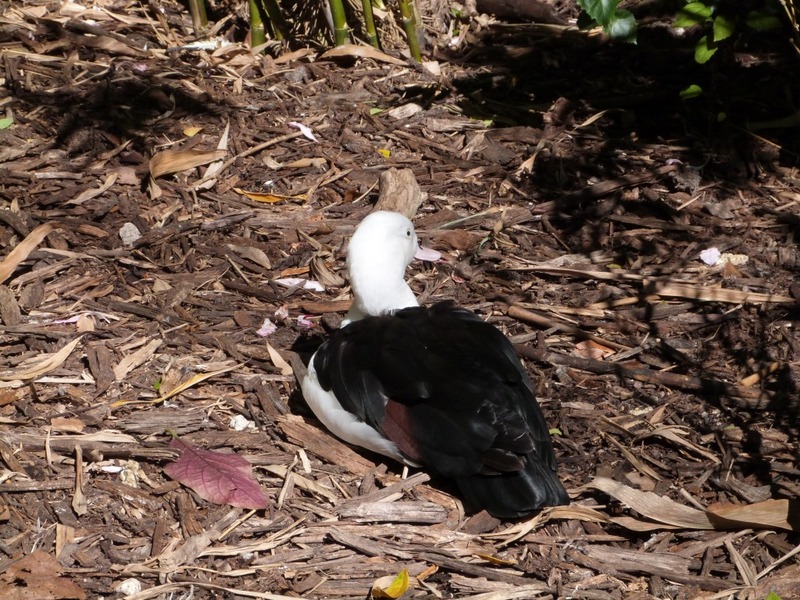 I enjoyed watching this female Pygmy Goose floating and took a short video of her. 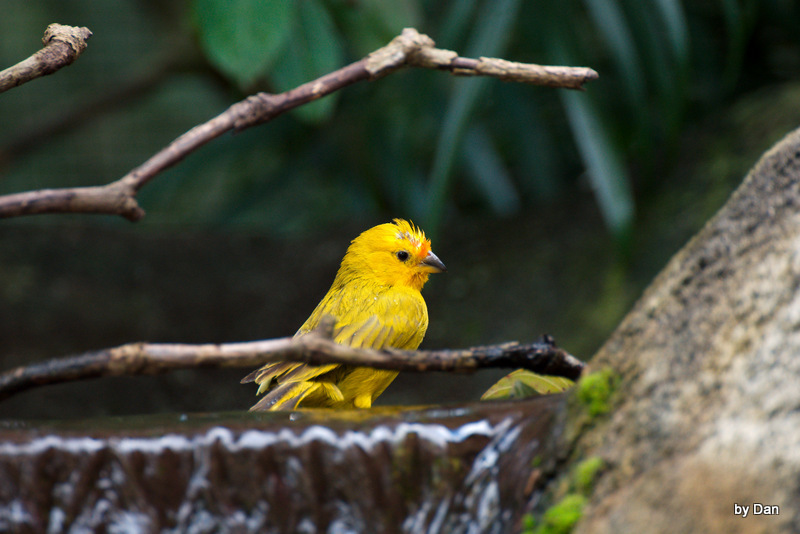 I just made a page for Zoo Miami and the Wings of Asia under the Birdwatching Trips. There are most of the articles that have been written about our visits to the Zoo, but especially to the Wings of Asia Aviary. That is where we spend most of our time. 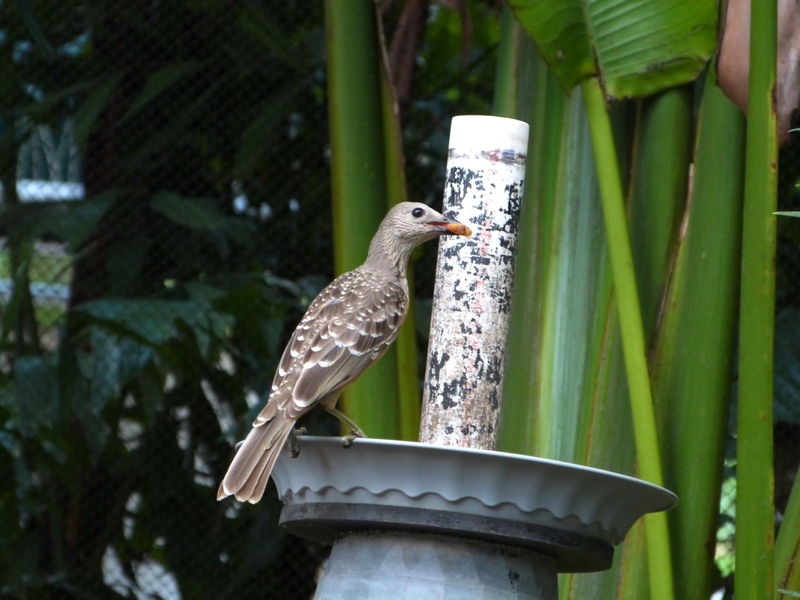 This last trip was our fourth visit down to Miami to see those amazing birds. 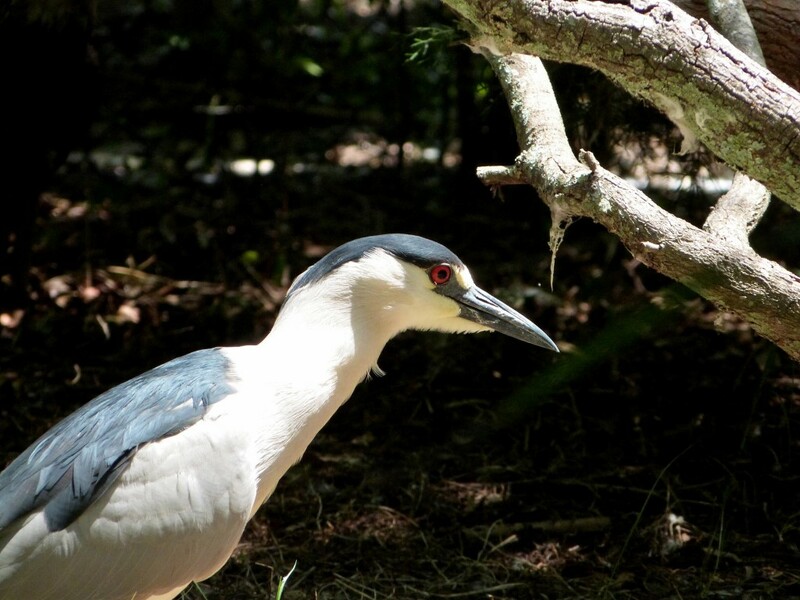 We enjoyed our latest birdwatching adventure to Zoo Miami. 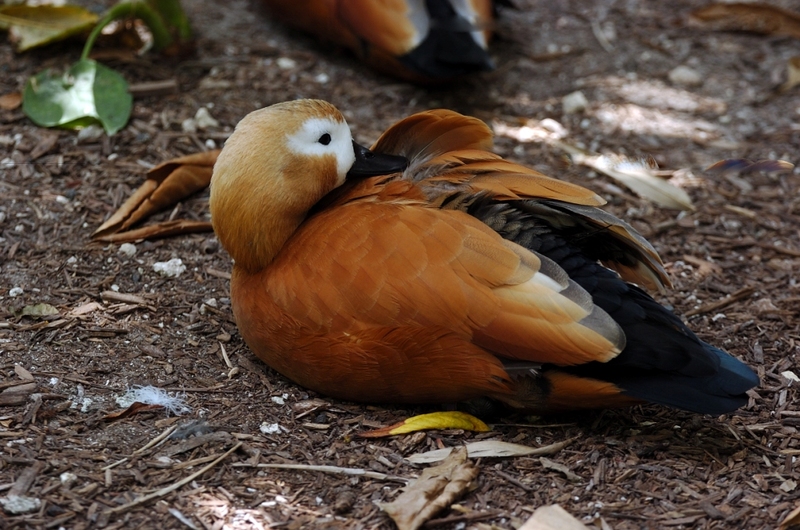 Caught video of the Ruddy Shelducks discussing something. 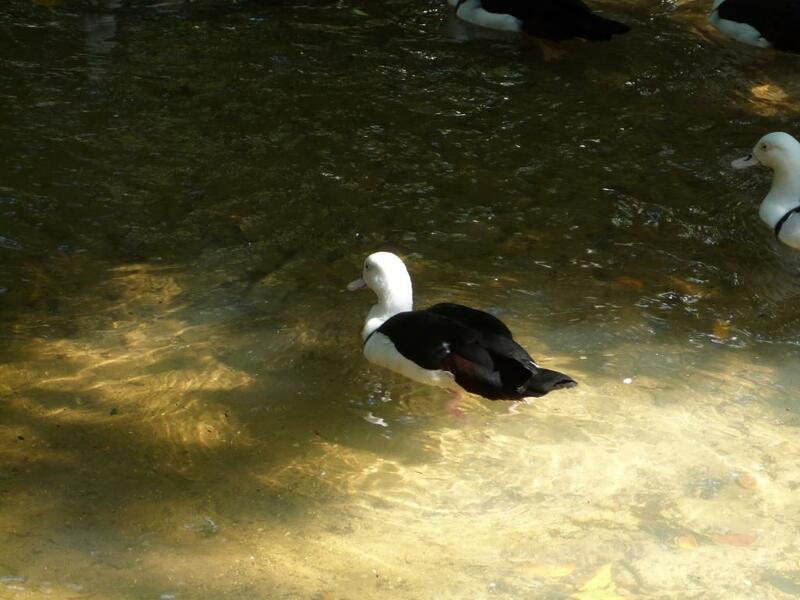 So this time we will share the two species of Shelducks at the Wings of Asia aviary. 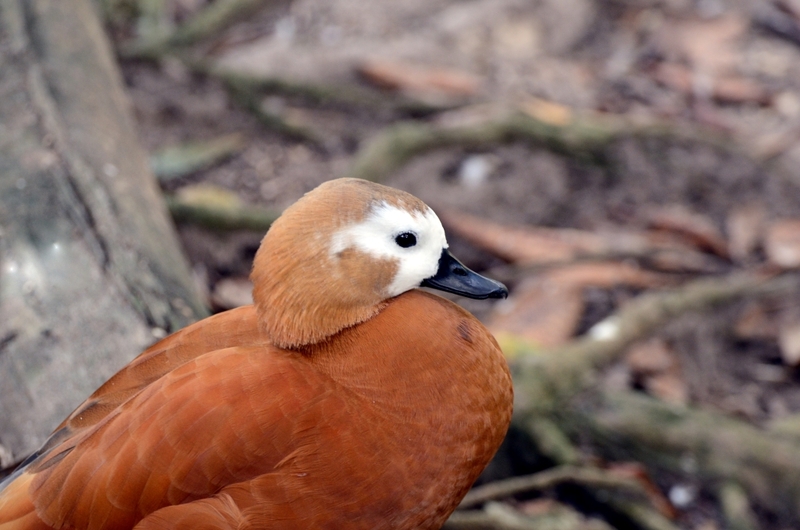 The Ruddy Shelduck (Tadorna ferruginea) and the Raja Shelduck (Tadorna radjah) are members of the duck, goose and swan family Anatidae – Ducks, Geese and Swans. 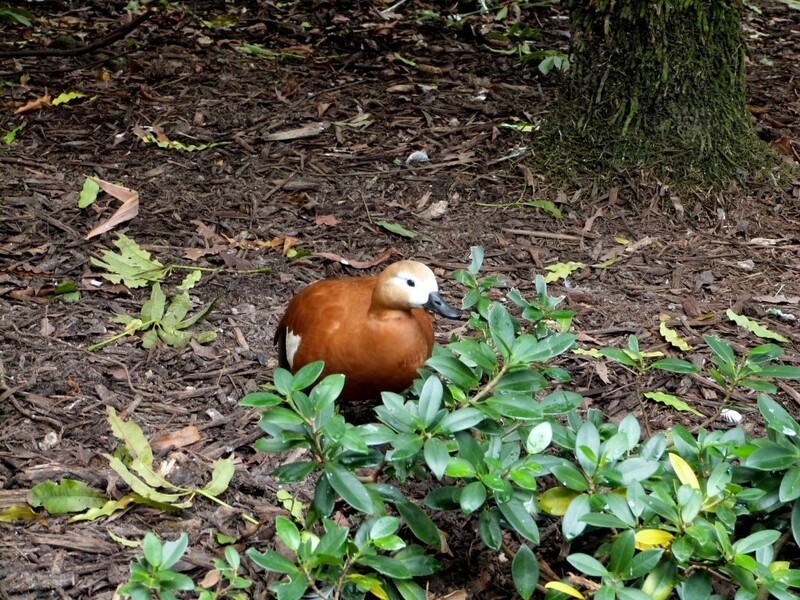 They are in the shelduck subfamily Tadorninae. There are seven species in the Tadorninae subfamily. 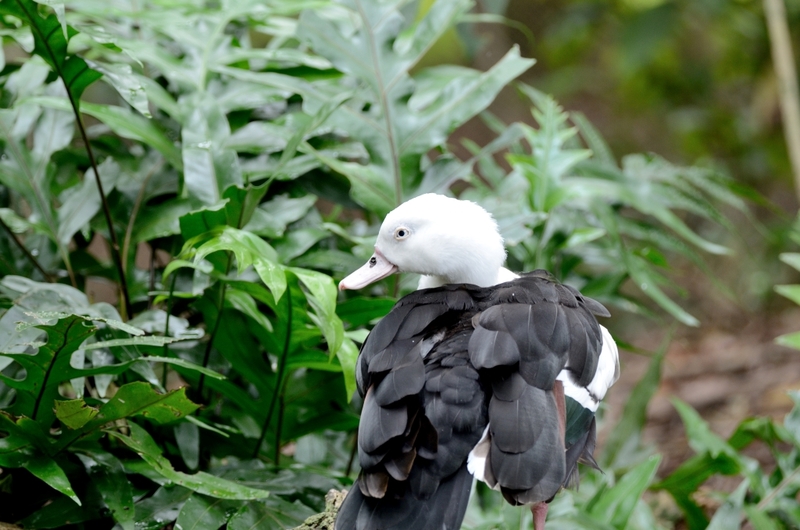 Wings of Asia has the Ruddy and Raja Shelducks. 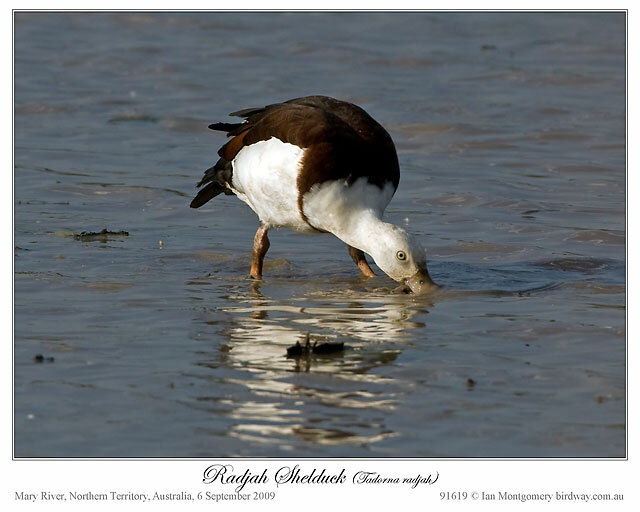 The Lord has provided for the Shelducks, as He does for all His critters. They are designed for the conditions they live in, in this case swimming, feeding and migrating, with beaks, feet, wings, and coloration to help them survive. 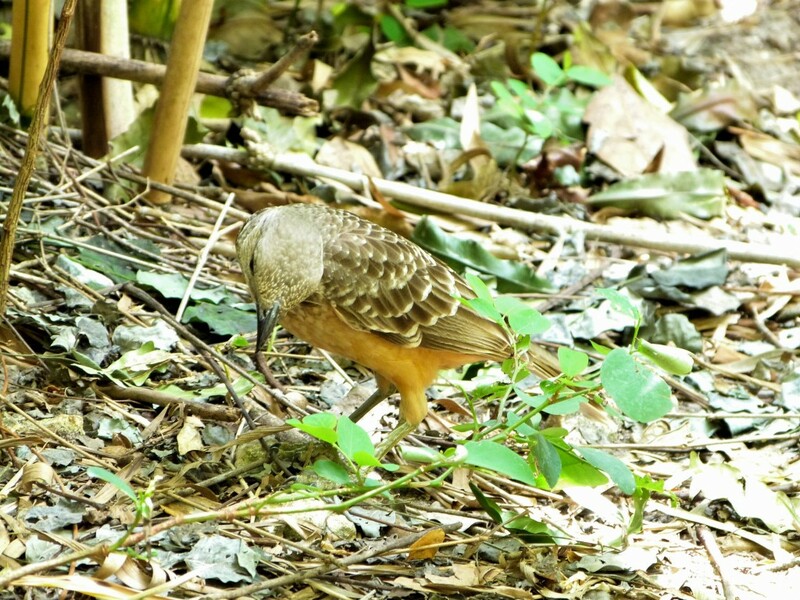 Ruddy – There are very small resident populations of this species in north west Africa and Ethiopia, but the main breeding area of this species is from southeast Europe across central Asia to Southeast Asia. 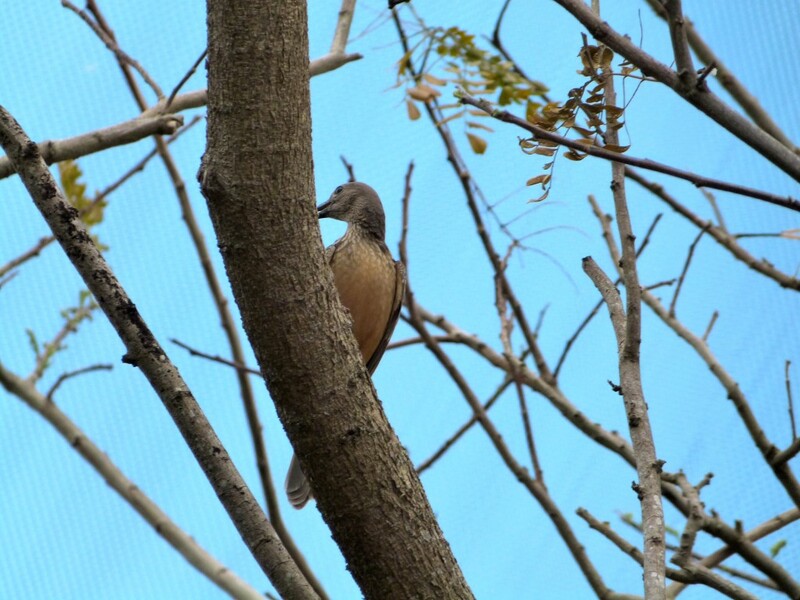 These birds are mostly migratory, wintering in the Indian Subcontinent. 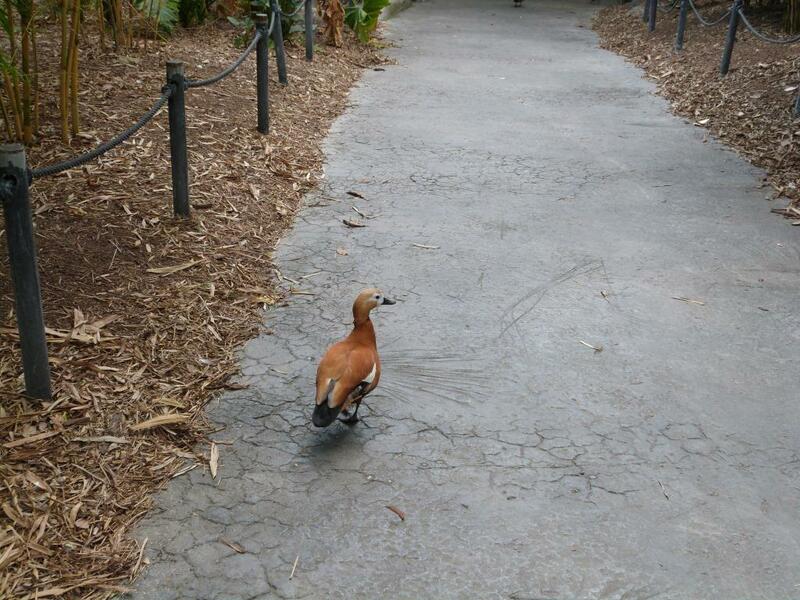 They are sometimes called Brahminy Ducks. Can be seen in many Zoos in America. 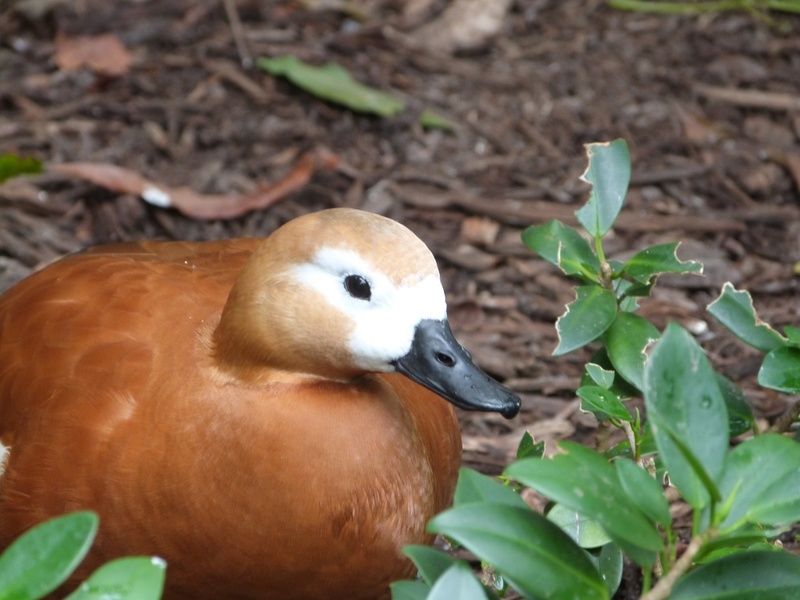 In Tibet and Mongolia, Ruddy Shelduck is considered sacred by the Buddhists. It is also a sacred animal in Slavic mythology. 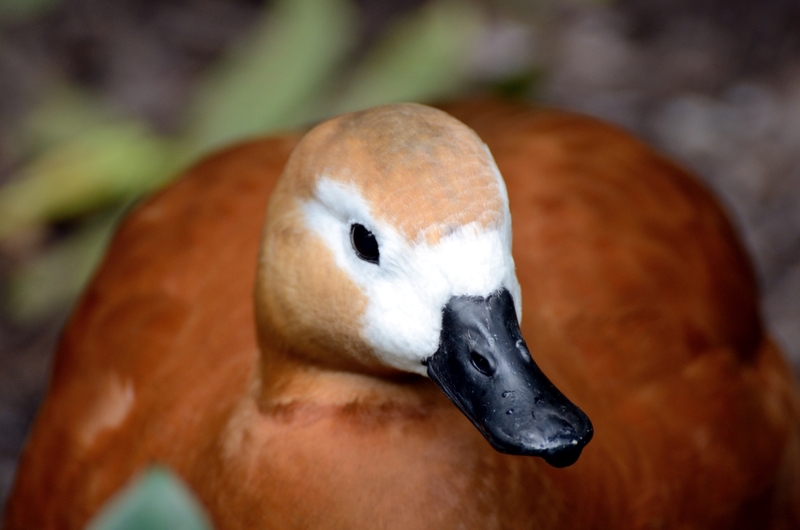 Although becoming quite rare in southeast Europe and southern Spain, the ruddy shelduck is still common across much of its Asian range. It may be this population which gives rise to vagrants as far west as Iceland, Great Britain and Ireland. However, since the European population is declining, it is likely that most occurrences in western Europe in recent decades are escapes or feral birds. Although this bird is observed in the wild from time to time in eastern North America, no evidence of a genuine vagrant has been found. 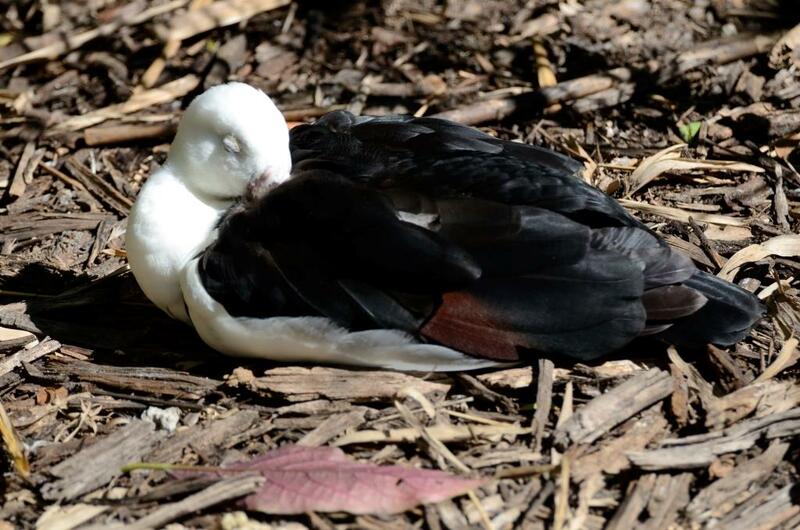 This is a bird of open country, and it will breed on cliffs, in burrows, tree holes or crevices distant from water, laying 6-16 creamy-white eggs, incubated for 30 days. The both shelduck is usually found in pairs or small groups and rarely forms large flocks. However, moulting and wintering gatherings on chosen lakes or slow rivers can be very large. 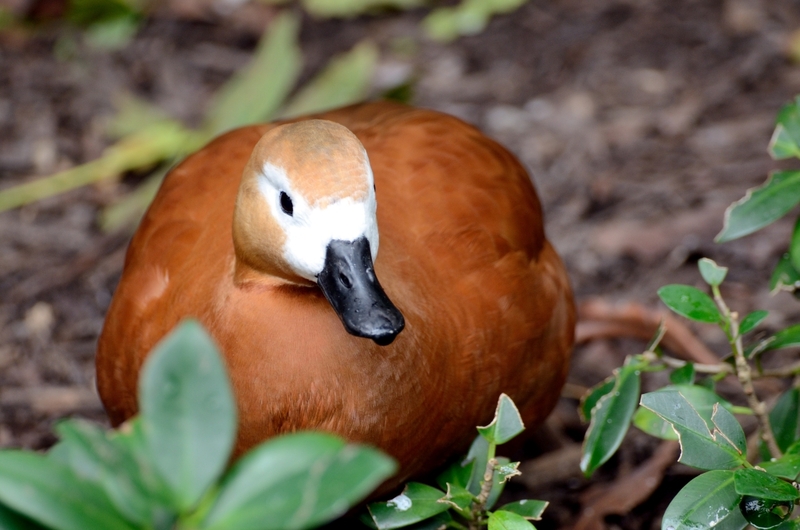 The ruddy shelduck is a distinctive species, 22.8-27.5 in (58-70) cm long with a 43-53 in (110–135 cm) wingspan. 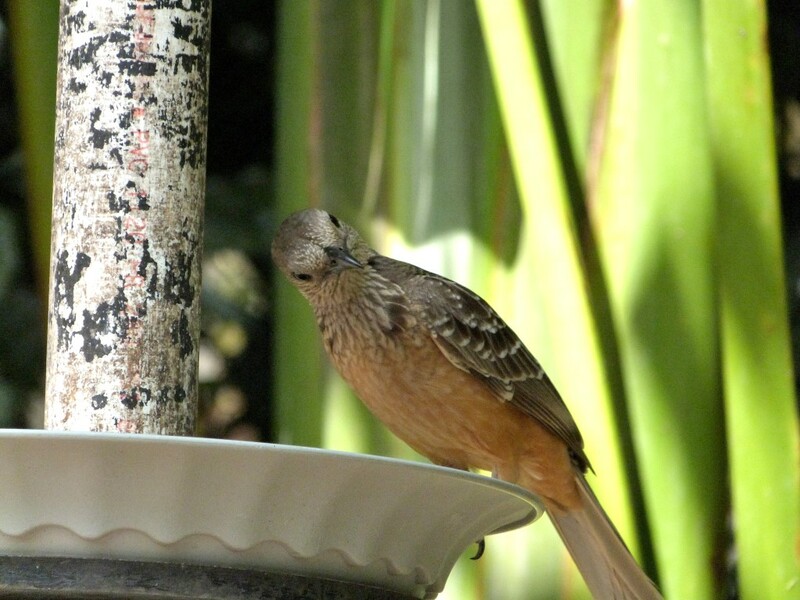 It has orange-brown body plumage and a paler head. The wings are white with black flight feathers. 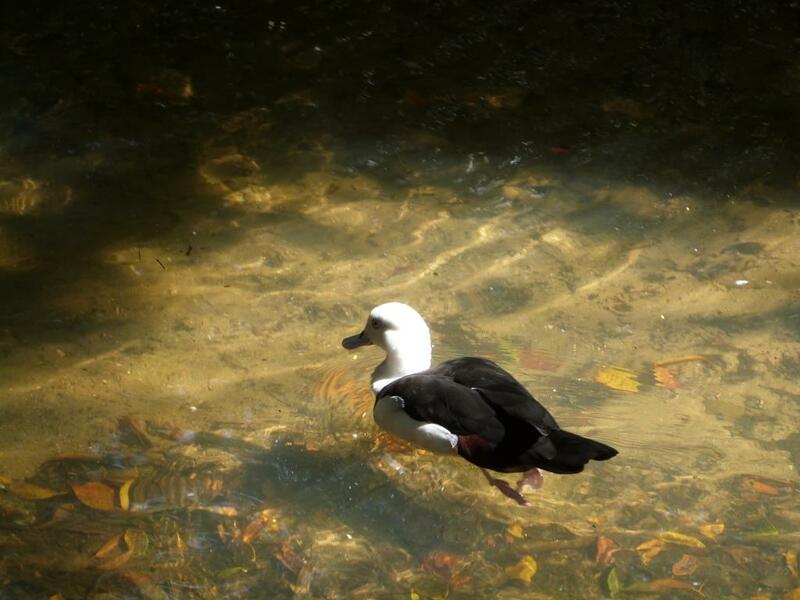 It swims well, and in flight looks heavy, more like a goose than a duck. The sexes of this striking species are similar, but the male has a black ring at the bottom of the neck in the breeding season summer, and the female often has a white face patch. The call is a loud wild honking. Not sure what these Ruddy’s were debating about, but it seems the single one lost the discussion and left. 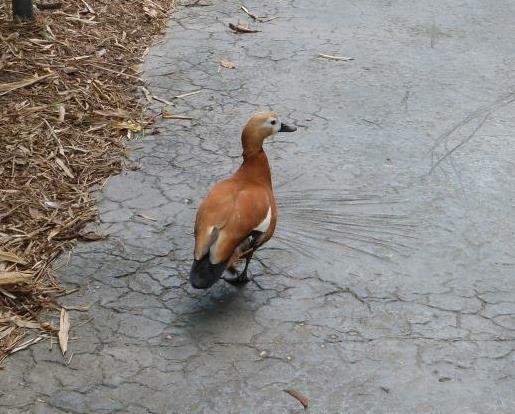 The ruddy shelduck is a common winter visitor in India. 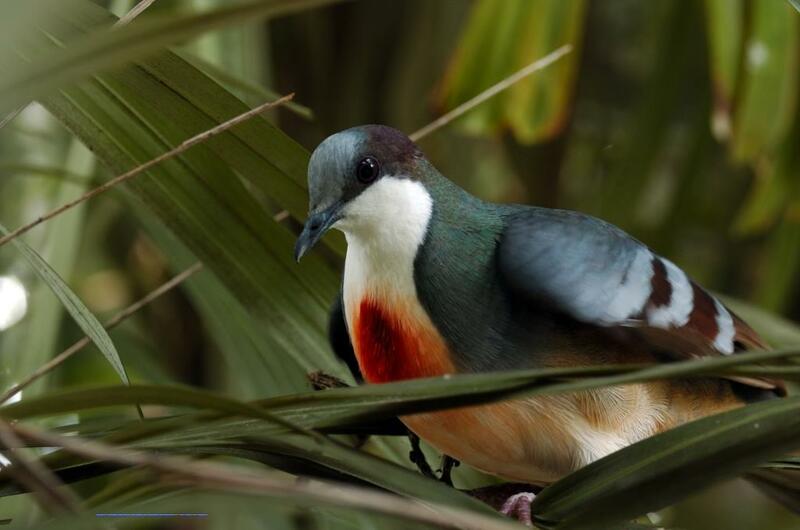 This bird is found in large wetlands, rivers with mud flats and shingle banks. Found in large congregation on lakes and reservoirs. It breeds in high altitude lakes and swamps in Jammu & Kashmir. Arrives in north India by October and departs by April. 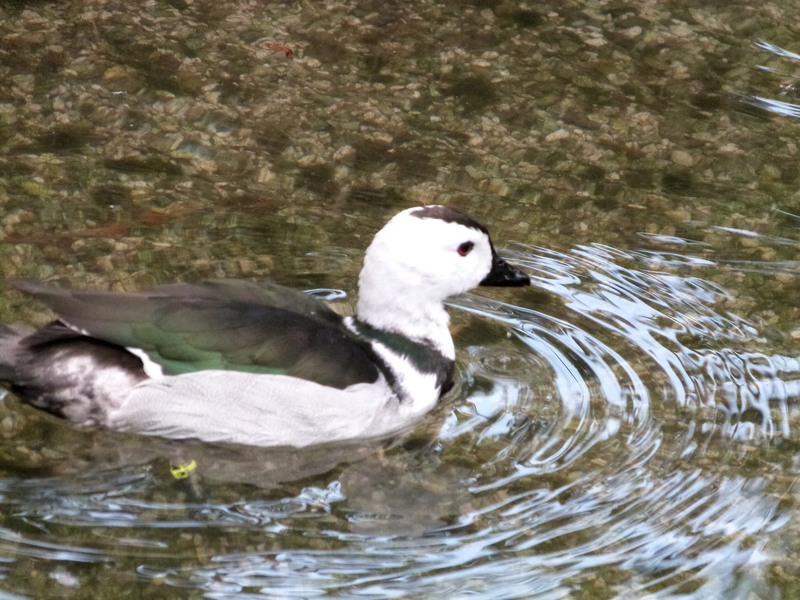 The genus name Tadorna comes from Celtic roots and means “pied waterfowl”, essentially the same as the English “shelduck”. 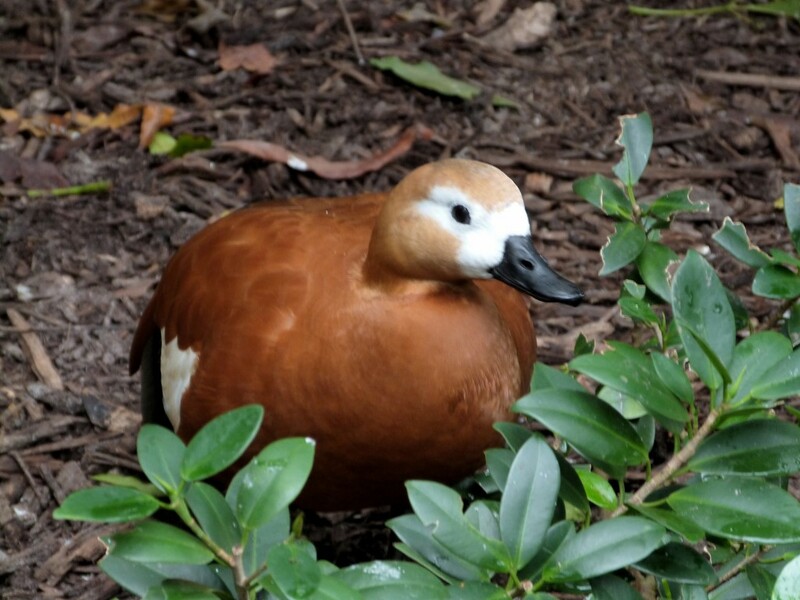 Raja Shelduck – The Radjah Shelduck (Tadorna radjah), is a species of shelduck found mostly in New Guinea and Australia, and also on some of the Moluccas. 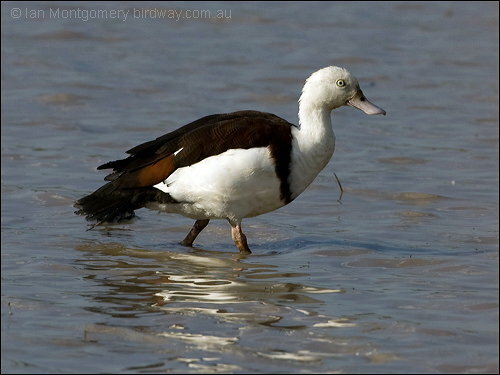 It is known alternatively as the raja shelduck (IOC Name), black-backed shelduck, or in Australia as the Burdekin duck. 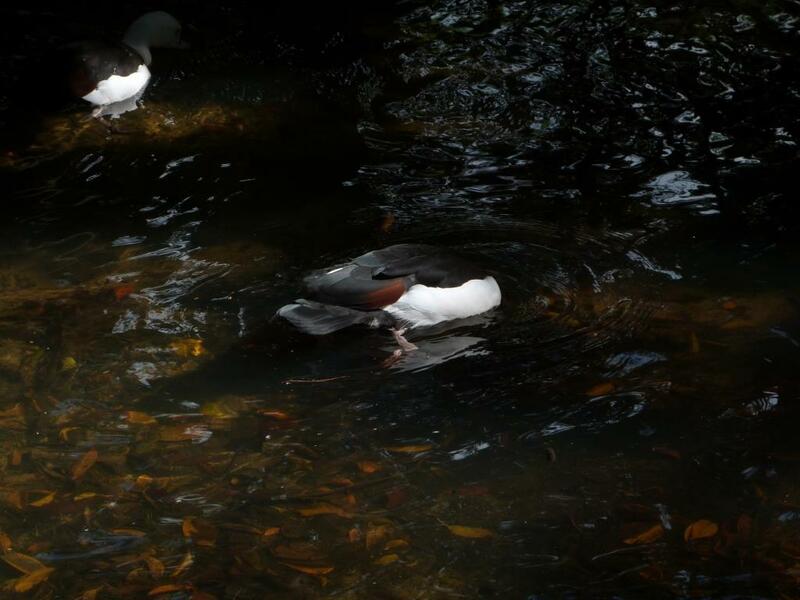 The Raja Shelduck forms long-term pair-bonds, and is usually encountered in lone pairs or small flocks. During the wet season the males commonly become very irritable, and have been observed attacking their mates. The diet consists mainly of mollusks, insects, sedge materials and algae. Pairs start searching for nesting sites during the months of January and February. 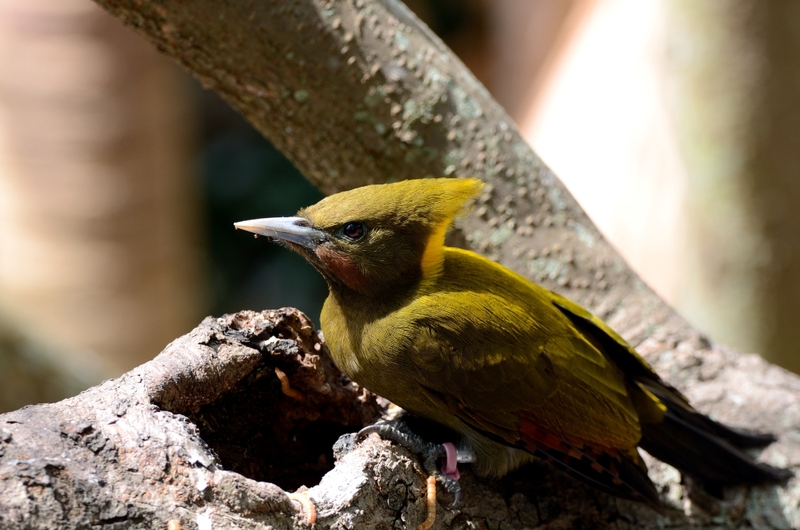 They nest close to their primary food source, often in the hollow limbs of trees, which makes habitat destruction a particular issue. Dan and I just returned from a three-day birdwatching adventure. With almost 1,000 photos and videos to sort, name, and clean-up, I’ll have plenty to post. 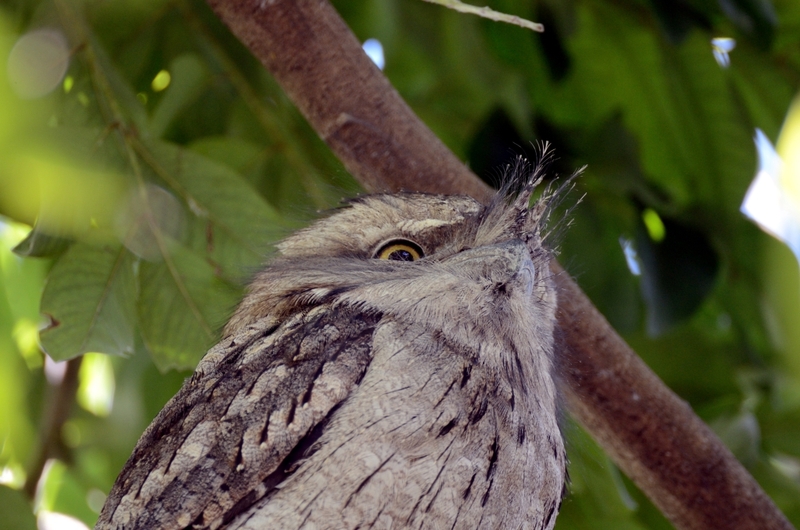 The Tawny Frogmouth (Podargus strigoides) is becoming a favorite of mine, because they are so hard to find. The Lord has given them such camouflage and an ability to freeze when threatened, they are a challenge. 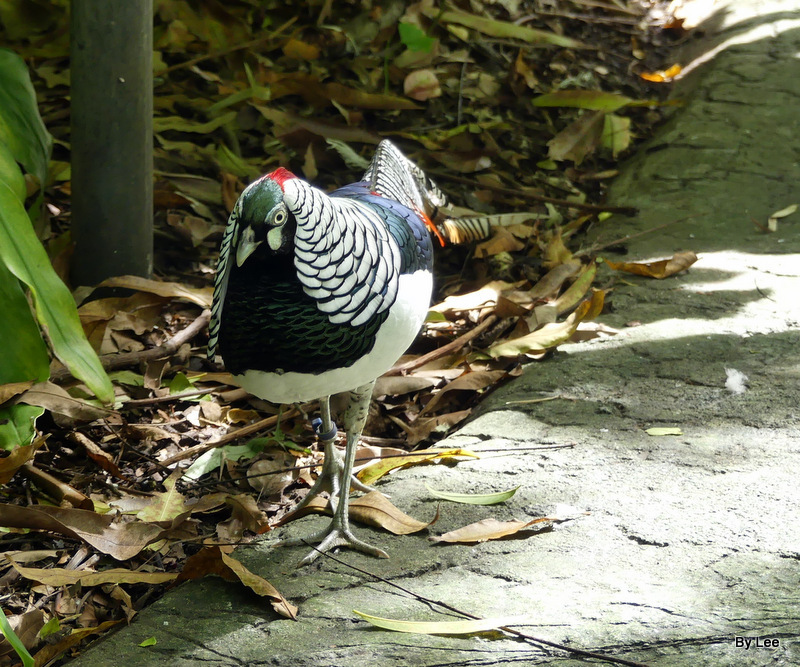 We were fortunate this time while visiting the Wings of Asia aviary at Zoo Miami. 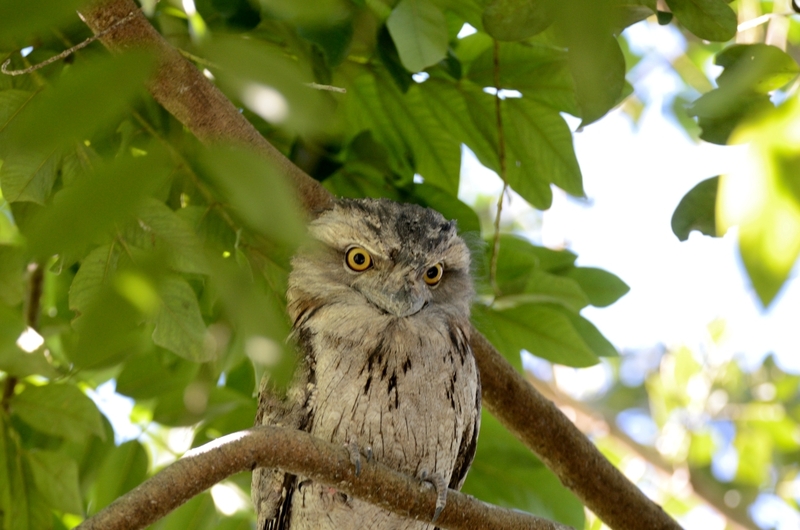 By following the feeder, that enjoys the birds as much as just working there, he helped us find the new Tawny Frogmouth. They now have two of them. This new one is more active and alert. Could it be that the feeder had a cup with 4 mice in it? We actually saw Tawny with his eyes open and I even got a short video of him opening that mouth that gives them their name. 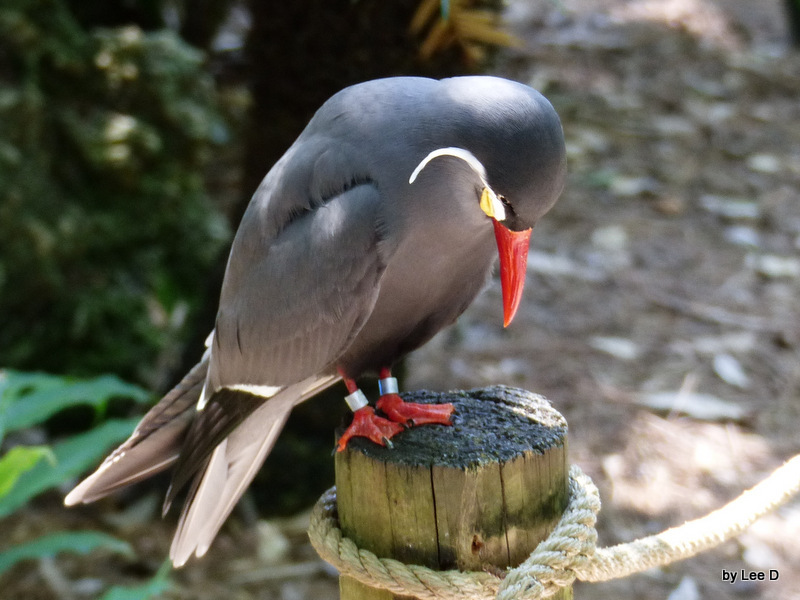 I have written about this bird before, Zoo Miami’s Wings of Asia – Wow! – I, seeing this one, forces me to write again. 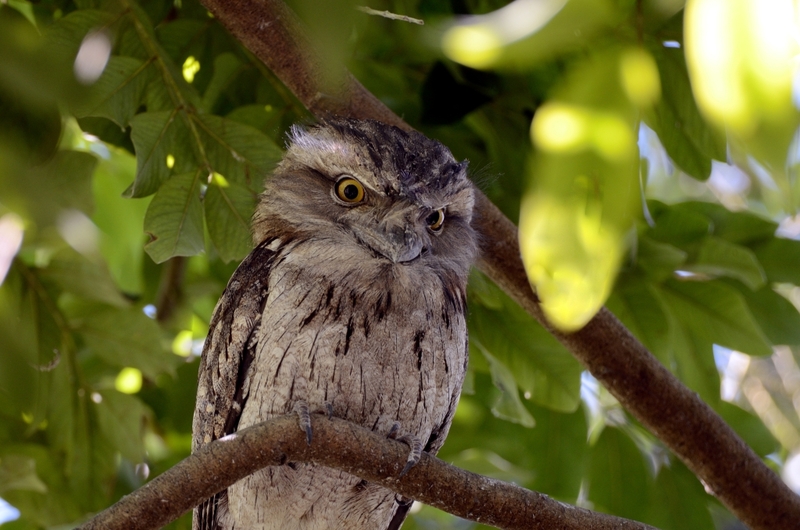 They belong to the Podargidae – Frogmouths Family which has 16 species of Frogmouths. 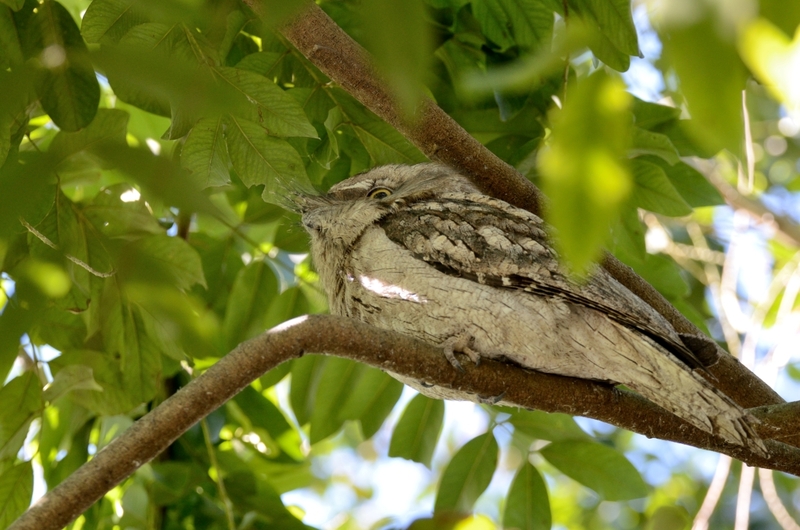 “Masters of Camouflage Related to Oilbirds, Whip-poor-wills, and Nighthawks, the Tawny Frogmouth’s excellent camouflage covering makes it look like dried leaves. When frightened, the bird freezes in plosition and, with its cryptic colorations, looks like broken bramches.” (Amazing Bird Facts and Trivia, p 135) Isn’t the Lord’s Wisdom fantastic? This video is of two segments. The keeper tried to get him to come down and then we came back a second time. Several photographers were waiting to get a photo of him coming down, but I guess this calls for another excuse to visit the Wings of Asia. 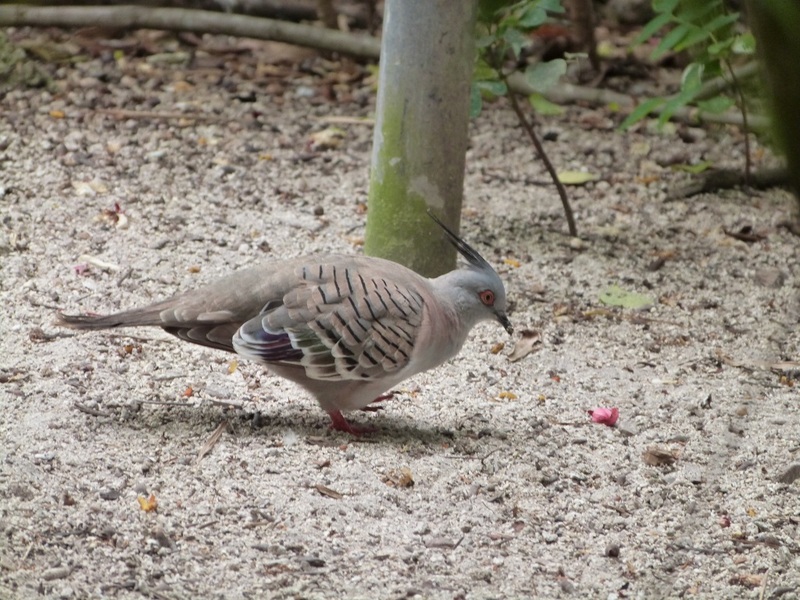 The Crested Pigeon was another interesting bird that we were able to watch at the Zoo Miami, Birds of Asia Aviary. I like their Crest. It adds some “class” to this creation from the Lord. They are colorful, but notice in the photos below how they blend in with their surrounding. The Creator has provided them with a nice camouflage design. 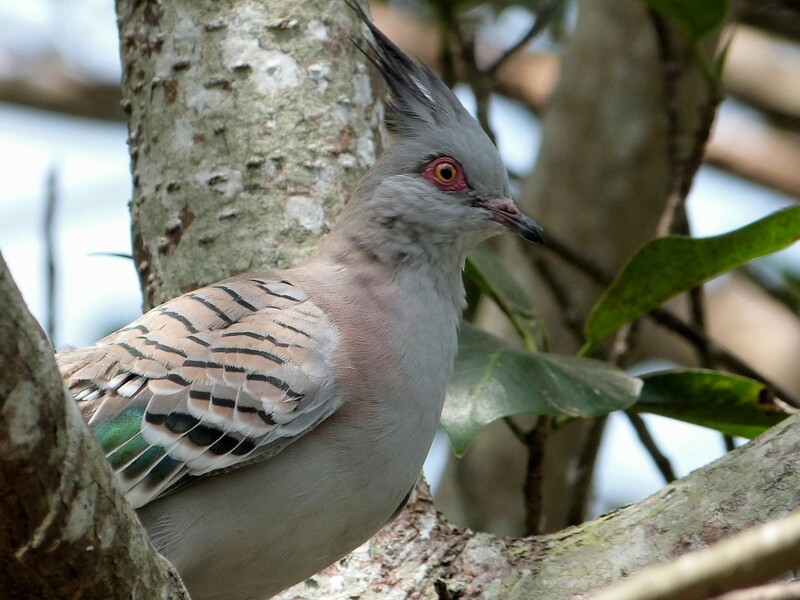 The Crested Pigeon (Ocyphaps lophotes, also commonly known as the Top Notch Pigeon) is a bird found widely throughout mainland Australia except for the far northern tropical areas. 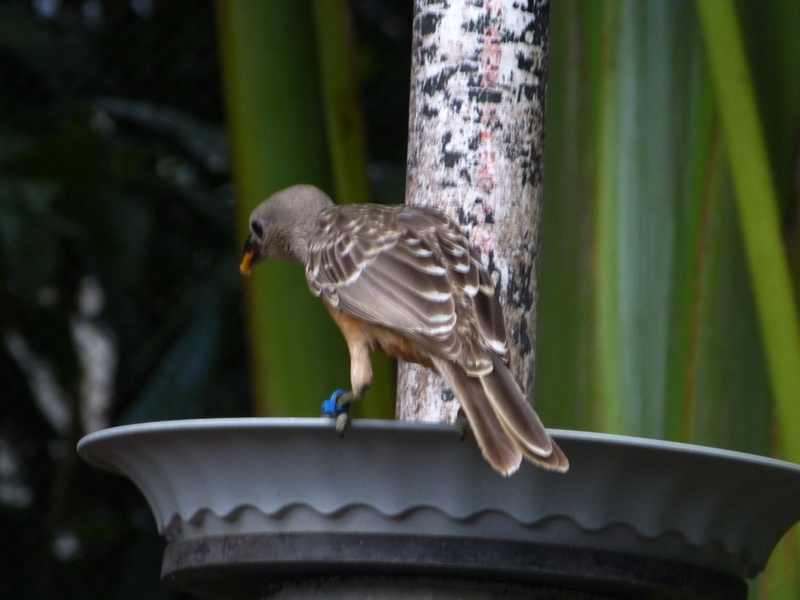 They belong to the Columbidae Family and is the only member of the genus Ocyphaps. 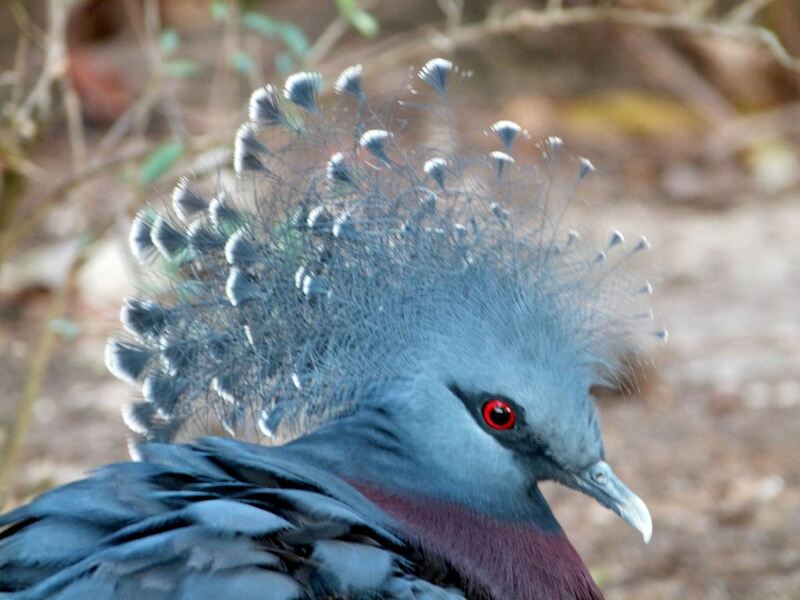 There are only two Australian pigeon species that possess an erect crest, being the Crested Pigeon and the Spinifex Pigeon. 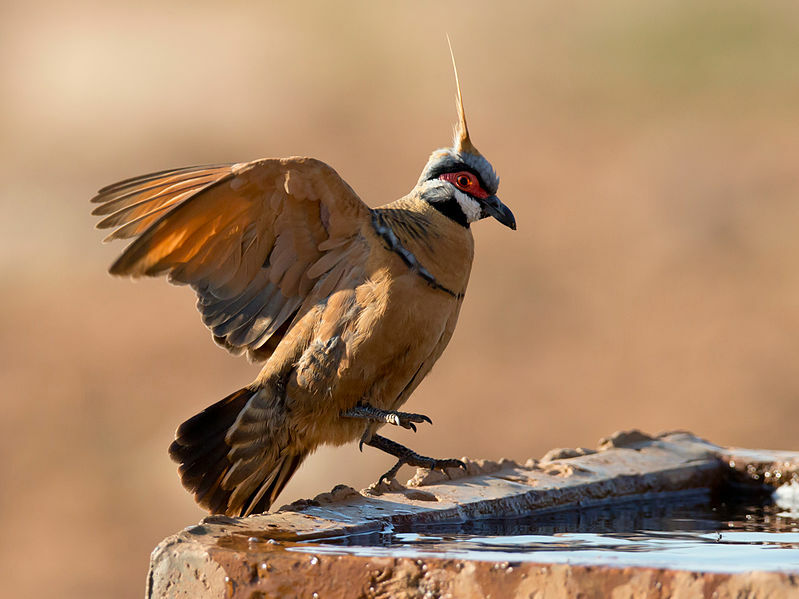 The Crested Pigeon is the larger of the two species. Habitat is grasslands, brush and wooded areas but they can also be seen at watercourses, homestead gardens, pastoral areas, sports grounds, and golf courses. Their habitat has expanded since settlement has produced pastoral lands (previously they were only found in inland and Western Australia). Foraging for grain, has adapted to grain farming areas, often feeding on the noxious weed of Salvation Jane. They are commonly misidentified as the Topknot Pigeon. I trust you enjoy the Crested Pigeon (Ocyphaps lophotes). My computer is off line, in fact, not even set up. A new flooring is being installed in that room and it is getting a new coat of paint. So it will be down for several days. This is being scheduled ahead of time. 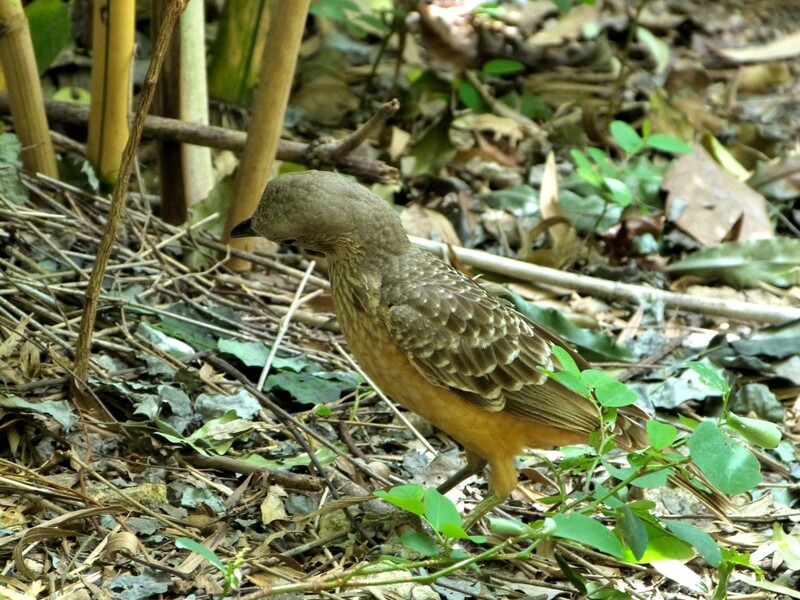 One of the neatest thing to watch on this last trip to the Wings of Asia Aviary at Zoo Miami was the Fawn-breasted Bowerbird working on his bower. 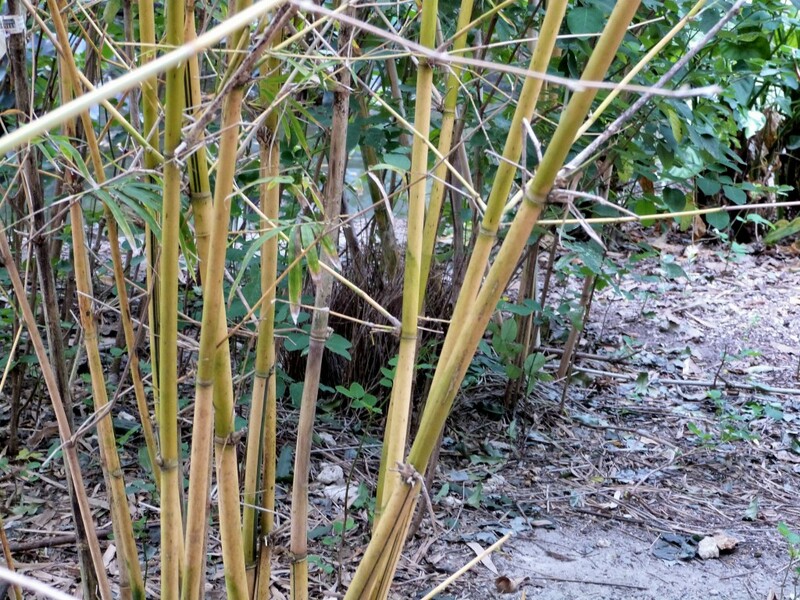 “The bower itself is that of “avenue-type” with two sides of wall of sticks and usually decorated with green-colored berries.” In his case, he had green leaves laid out in front. 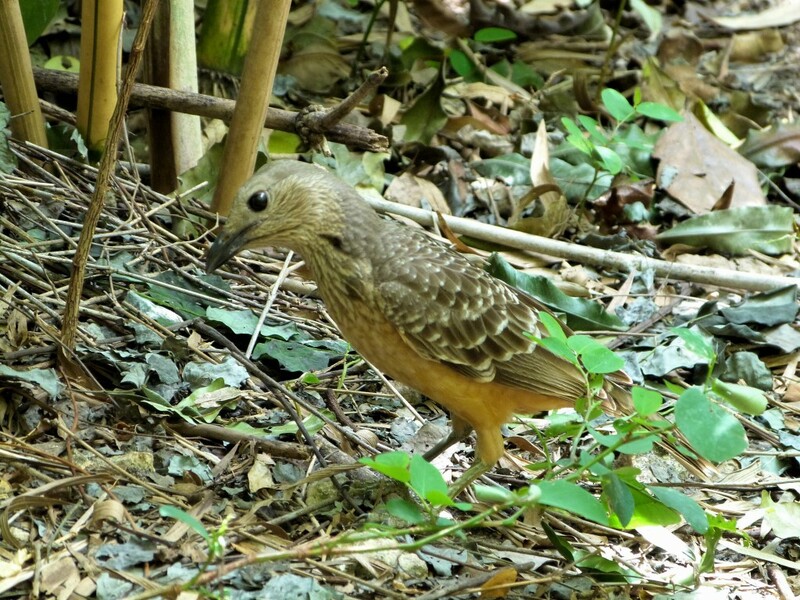 The Fawn-breasted Bowerbird (Chlamydera cerviniventris) is a medium-sized, up to 13 in (32 cm) long, bowerbird with a greyish brown spotted white plumage, a black bill, dark brown iris, yellow mouth and an orange buff below. Both sexes are similar. 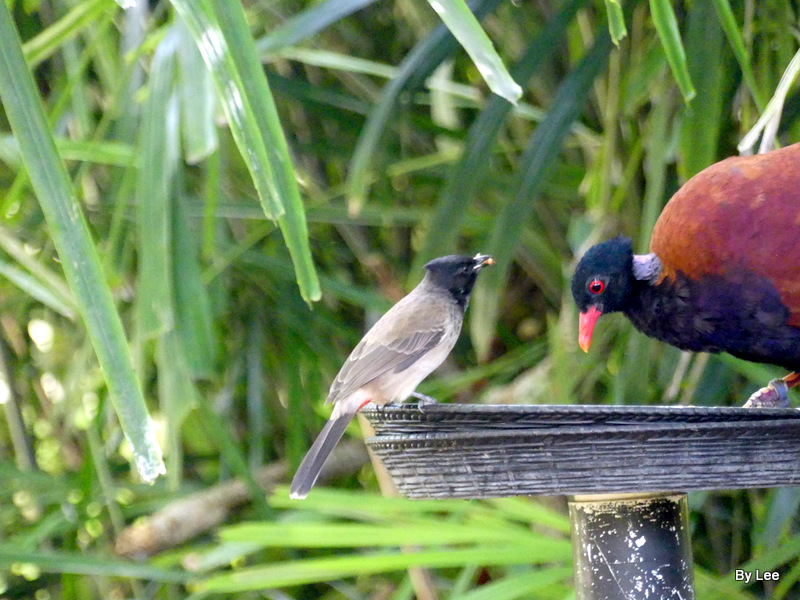 The female is slightly smaller than the male. 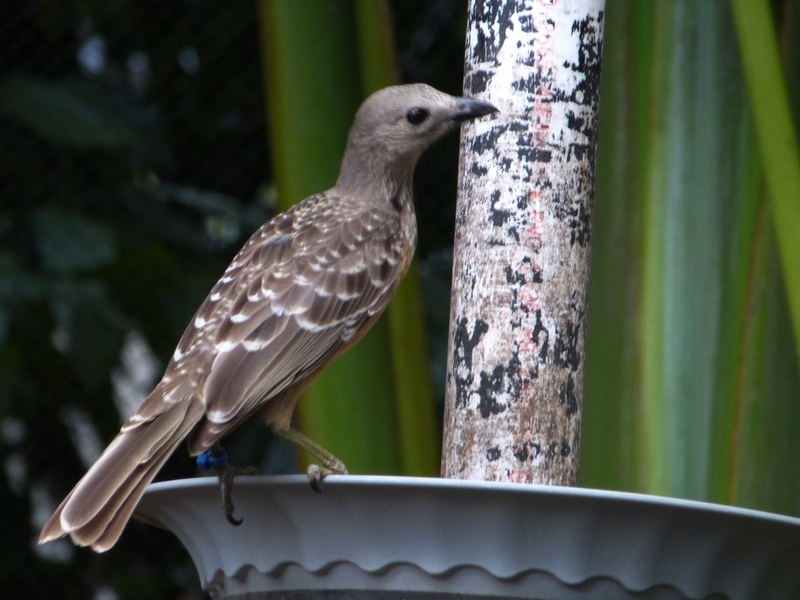 The Bowerbirds are in the Ptilonorhynchidae-Bowerbird Family. 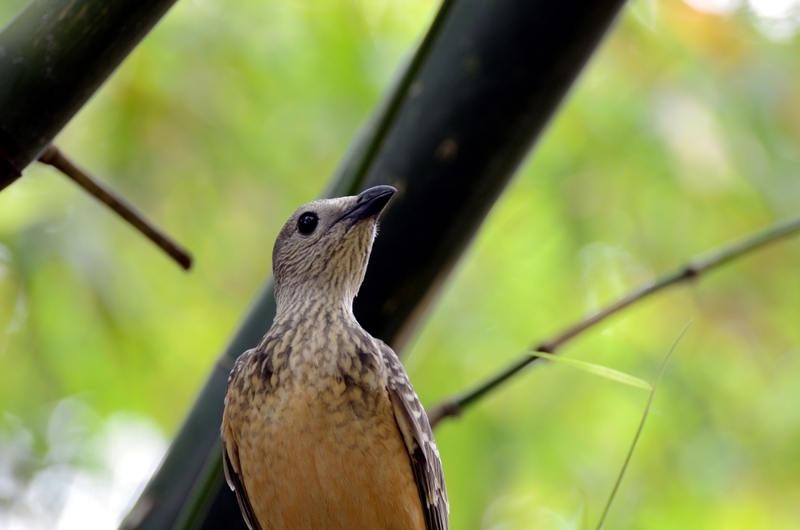 There are twenty species in the family, of which, 16 are Bowerbirds. 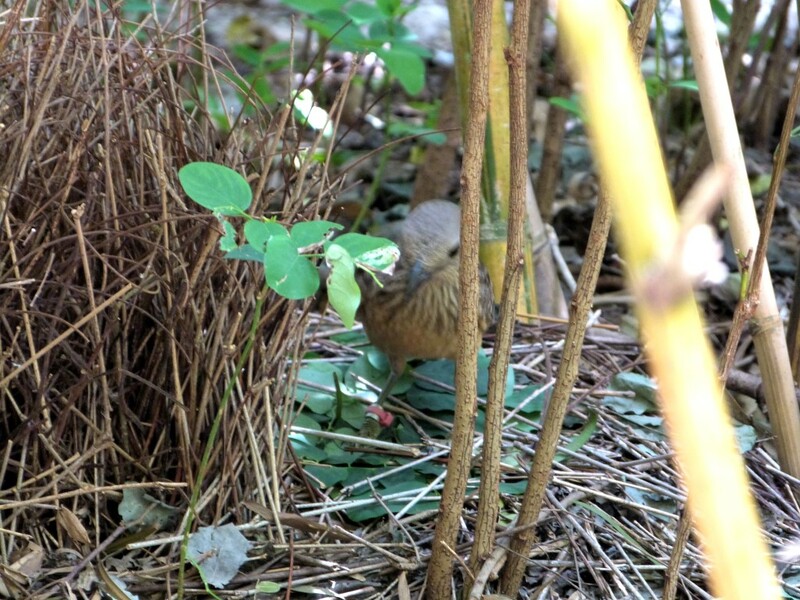 Here are two video clips of him working on the bower. 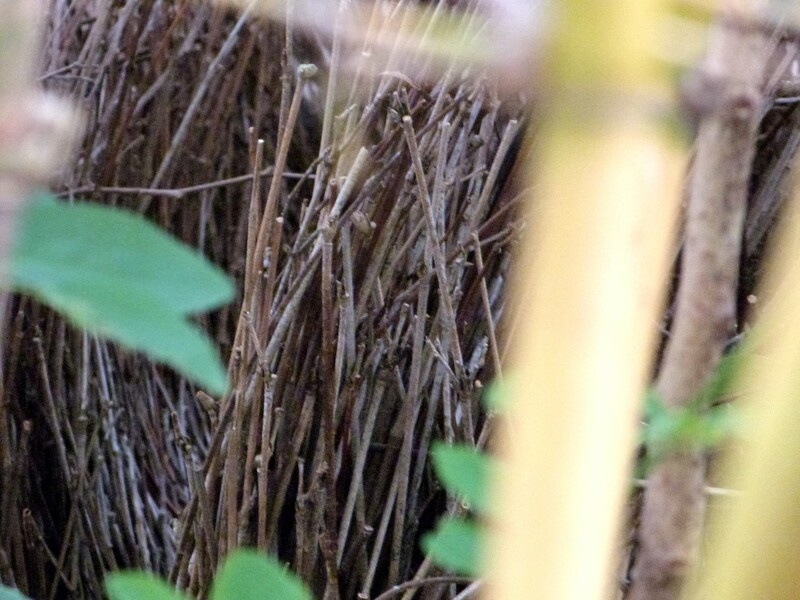 Notice how he goes in and out the other end of the bower. Unfortunately we were only able to view it from the side. One shot he is actually placing the stick upright in the ground. (I recorded him for a bit and then Dan came along. As I was explaining it to him, I got tickled, so ignore the snorts.) 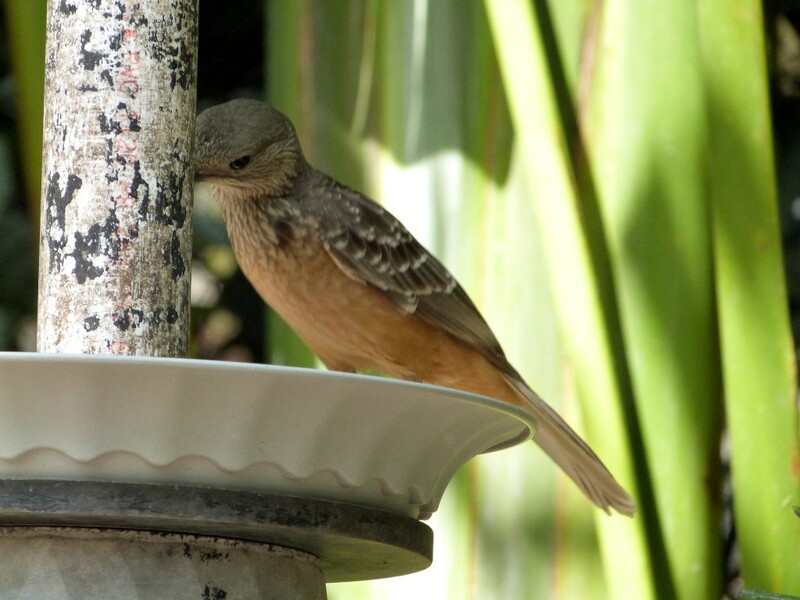 I was absolutely amazed watching this bird, which the Lord created, knowing how to make his bower chamber. Did you notice the birds chirping and singing in the background. 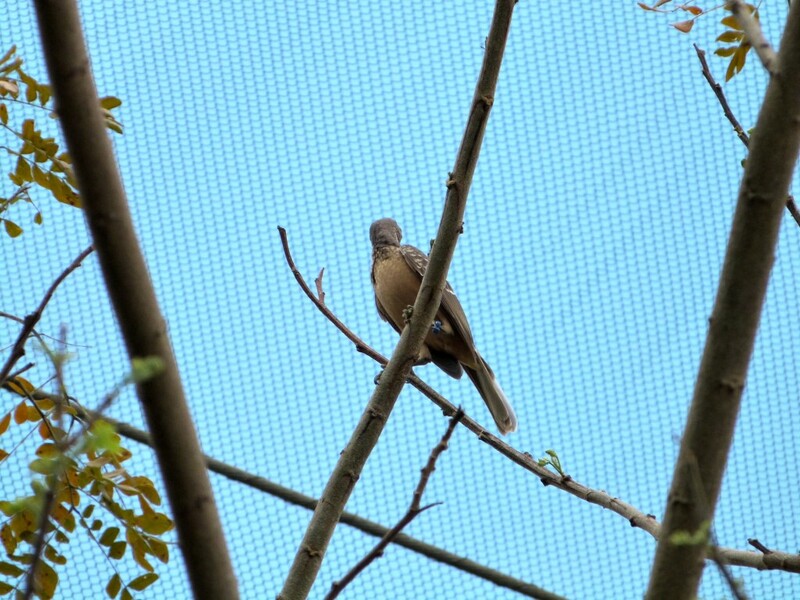 It is so peaceful in that aviary. The birds have so much room and places to hang out. You actually “bird watch” there. 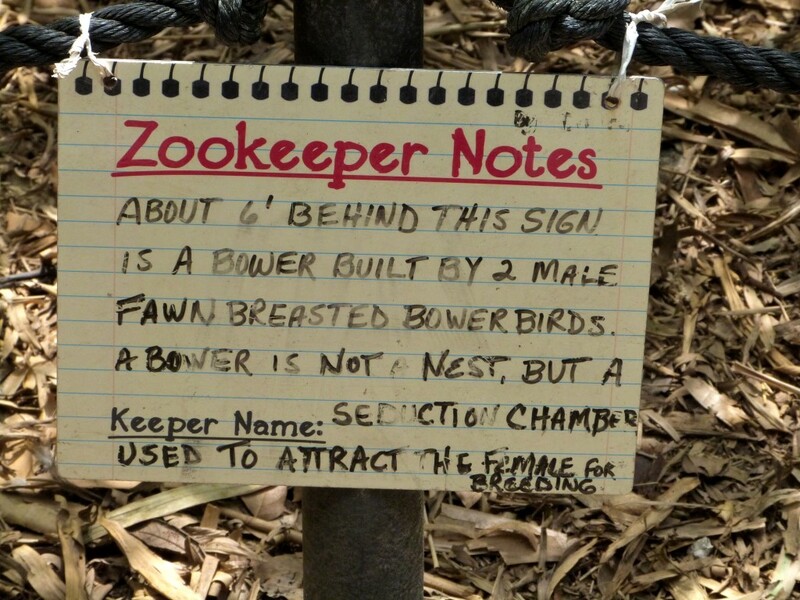 This is the sign telling about the Bowerbird and their name for it; a “Seduction Chamber.” We know that the Lord commanded the birds to reproduce and this bird is only following instructions. 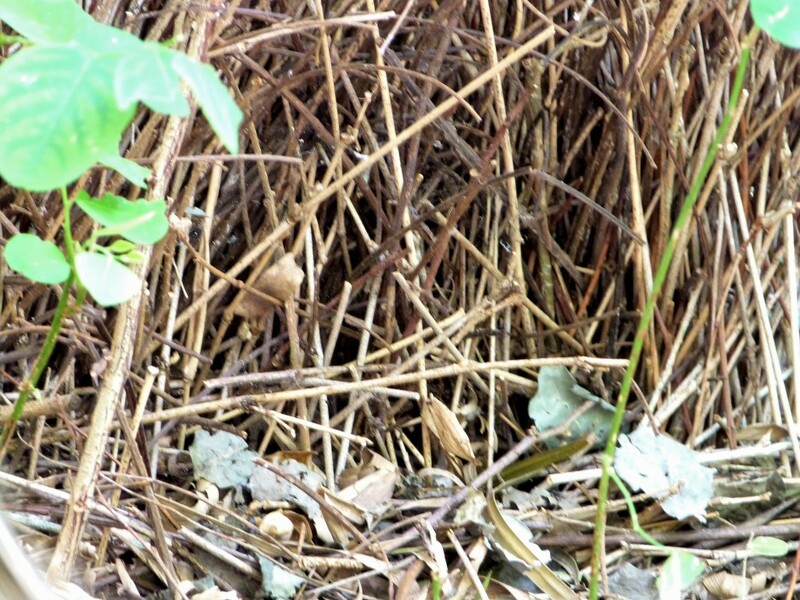 He builds his bower to entice a female to be his mate. The Fawn-breasted is fine in what he is doing, but we can learn by watching and taking heed for ourselves. 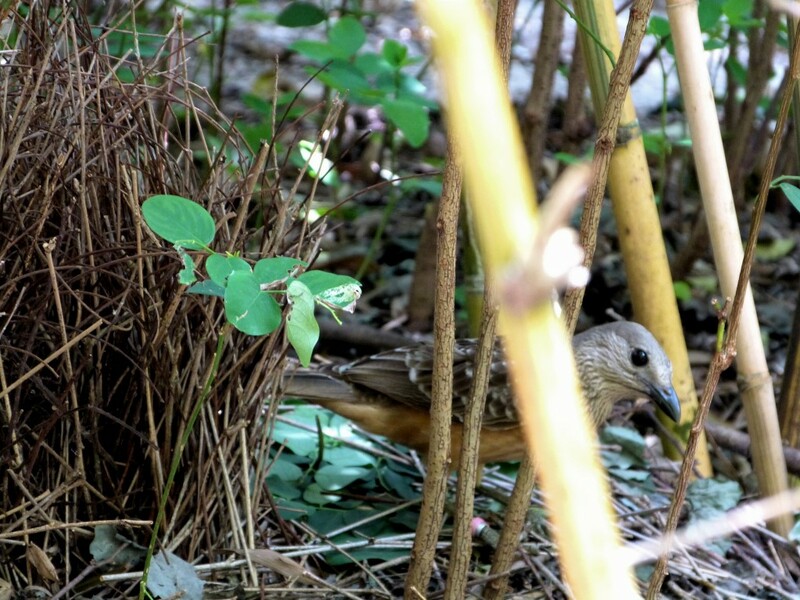 Fawn-breasted Bowerbird as entrance. Notice the leaves for decoration. Getting ready to enter the back end.